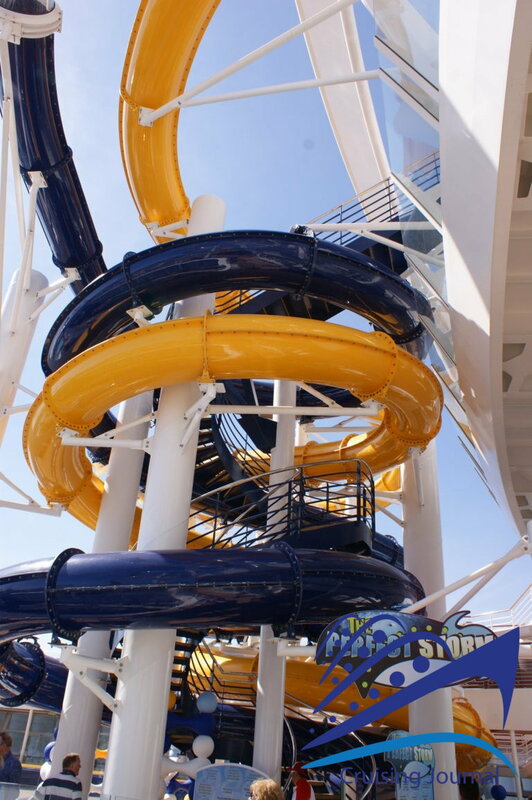 Have you cruised this Ship? Review it now on CruisingJournal! 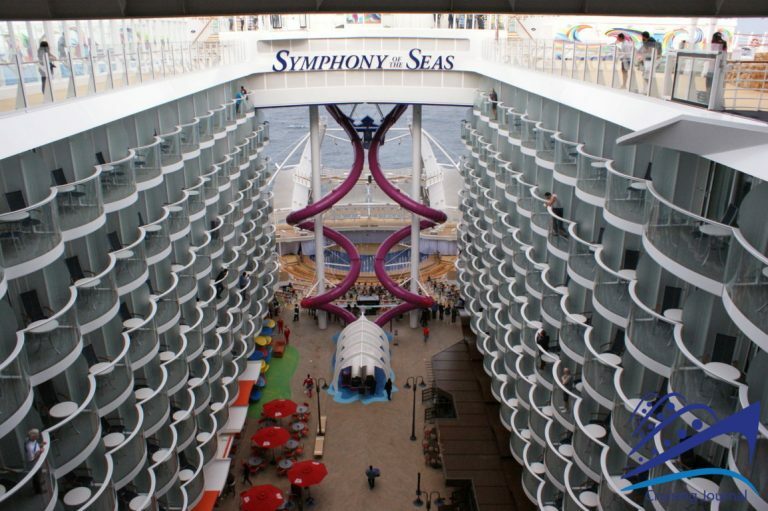 Describing Symphony of the Seas is not so easy. 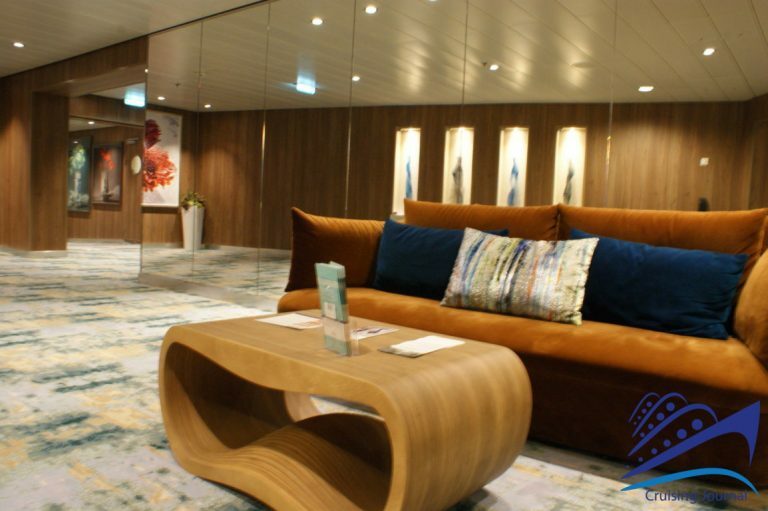 It’s not just its incredible size (over 228 thousand tons for over 362 meters in length), but the number of rooms and attractions you’ll find on board that will impress you. 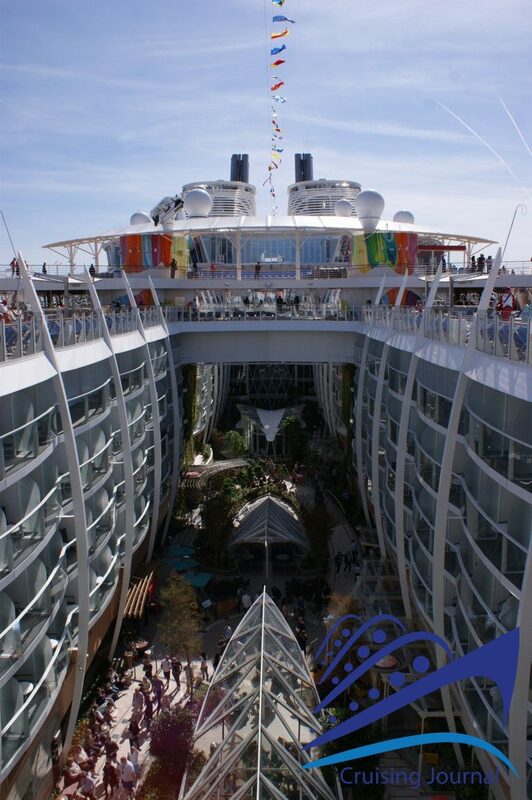 A real floating city where you can never get bored, with all the amenities and services you may need. 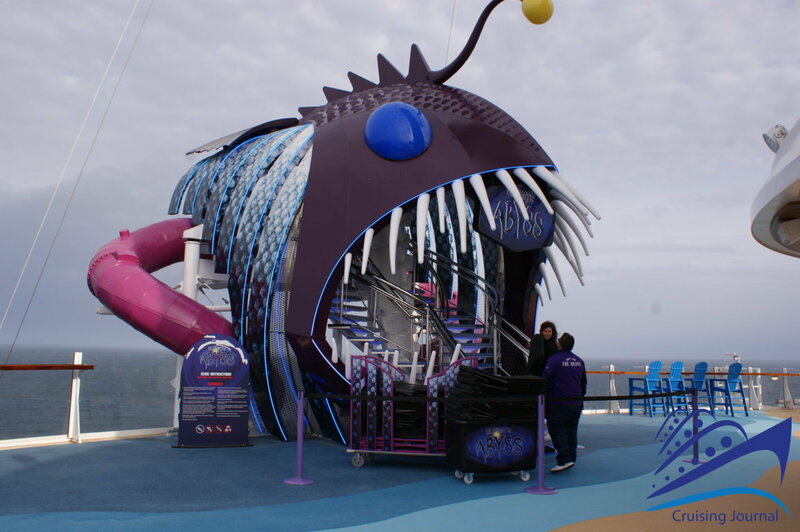 CruisingJournal will try to offer you a short virtual trip, but to really get an idea of this giant of the seas, even a one-week cruise will not be enough. 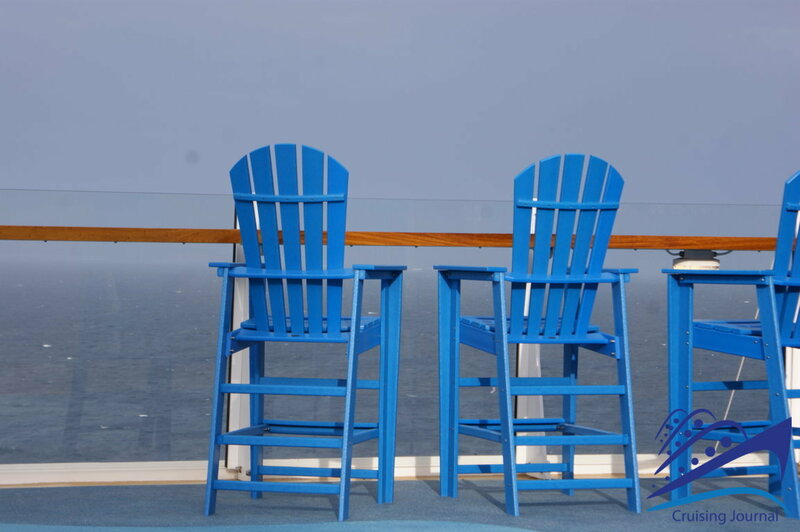 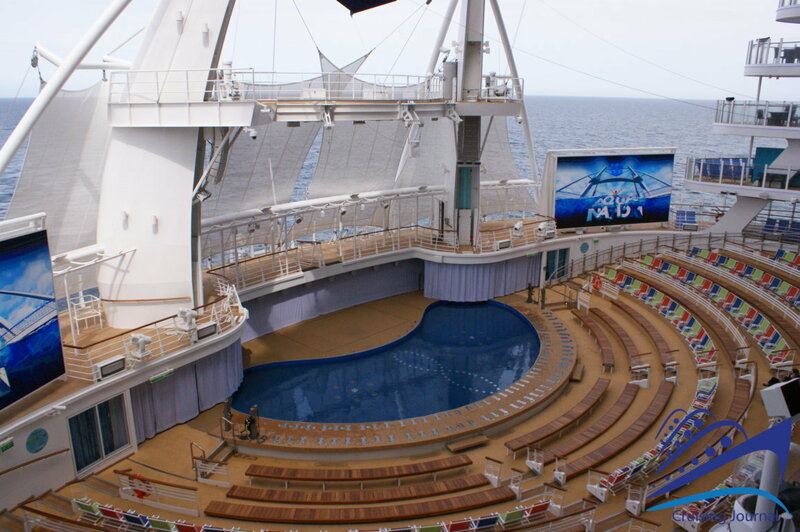 Let’s start with those things on board that will literally “WOW” you and that made it the flagship of Royal Caribbean. 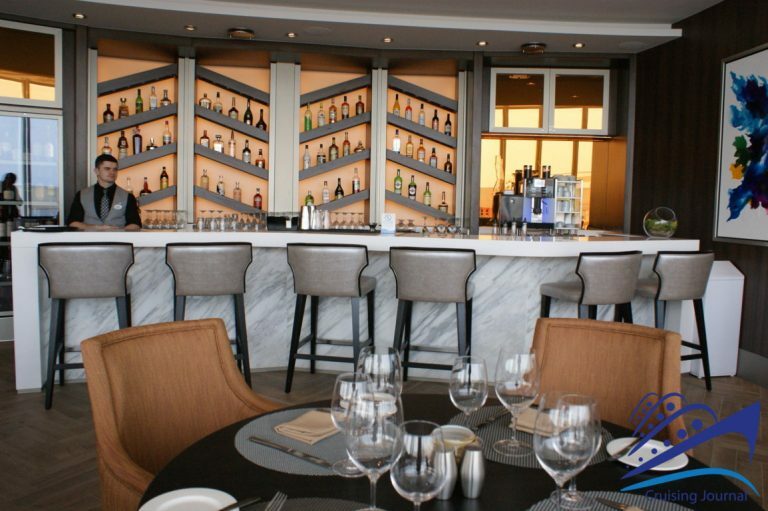 What about a coffee at Rising Tide Bar? 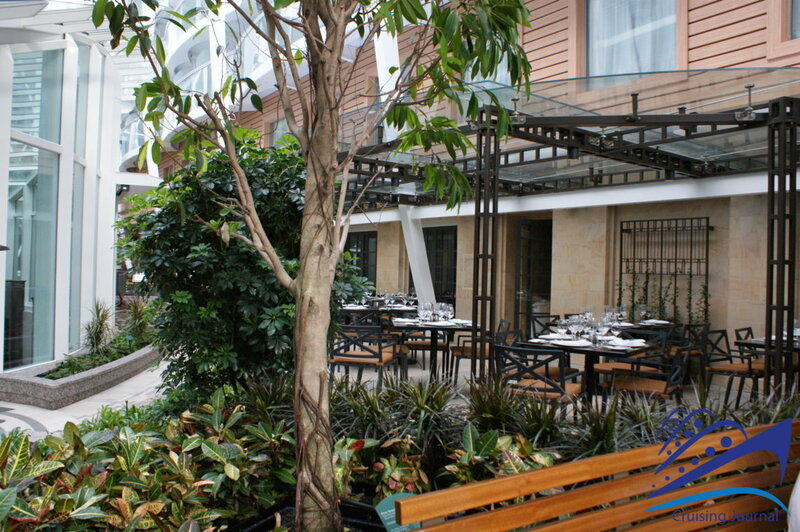 A platform that, from the Royal Promenade leads up to Central Park and, then, gradually down to the lively inner boulevard and the relaxing outdoor park. 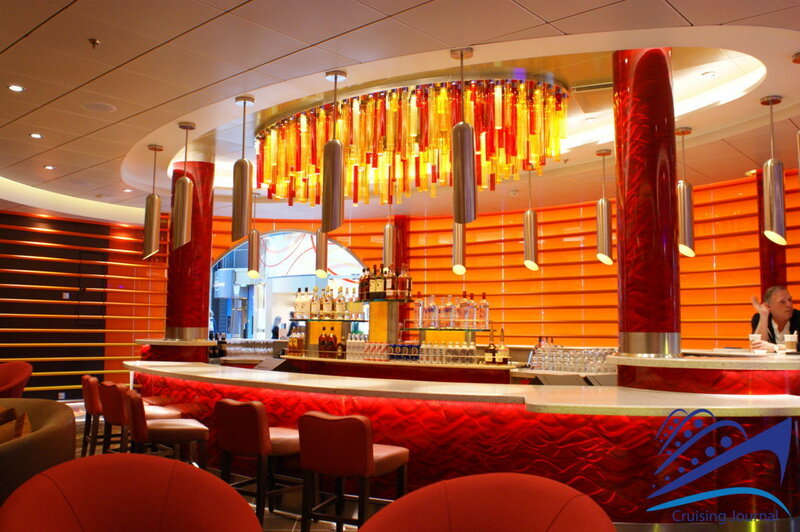 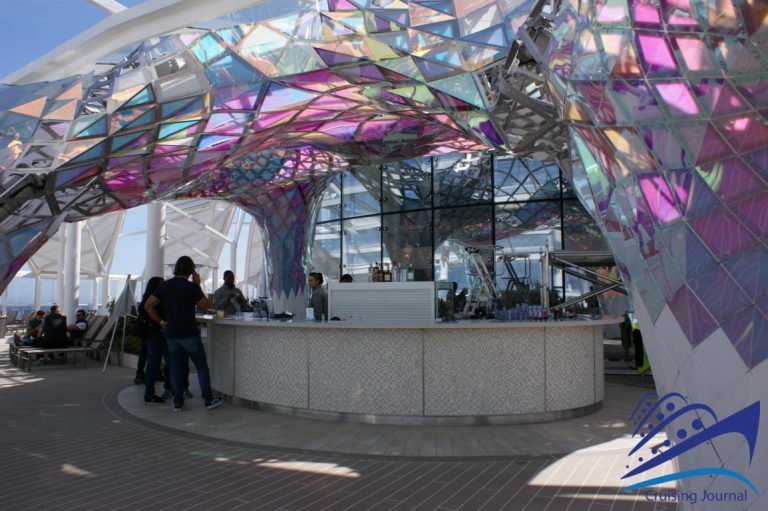 On the Promenade, you will also have the chance to order a cocktail made by a robotic bartender. 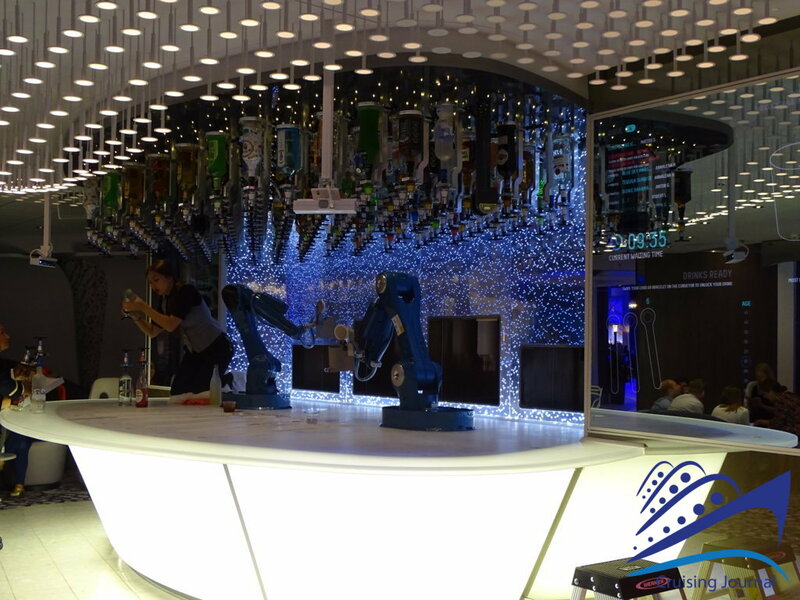 Bionic Bar allows you to choose your favorite drink and see it prepared automatically by a mechanical arm. 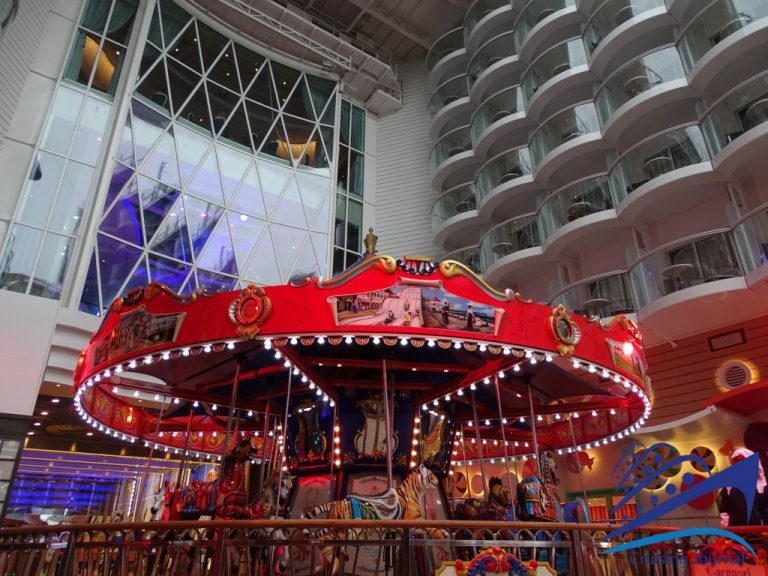 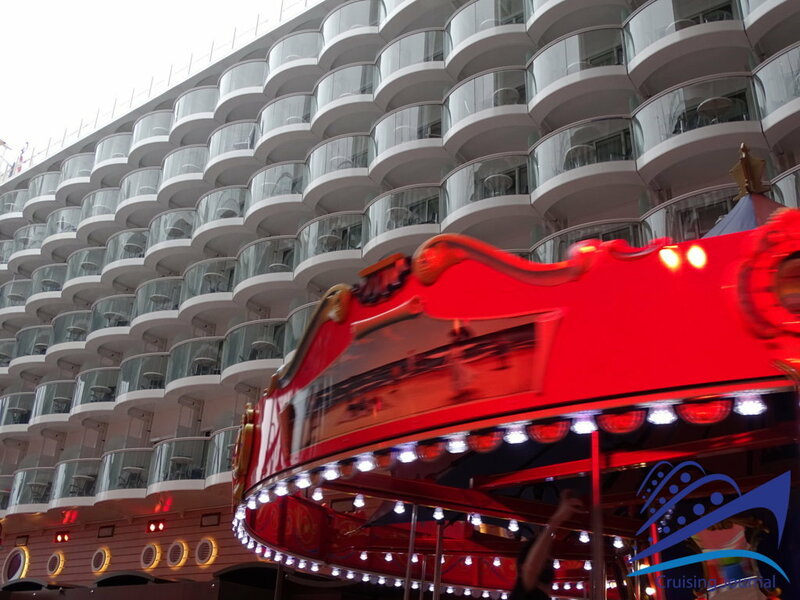 Then, going up to deck 6 and walking towards the stern, you will cross the lovely BoardWalk, pass the Carousel, a beautiful horse carousel, to reach the Aquatheatre, which offers truly amazing dive shows. 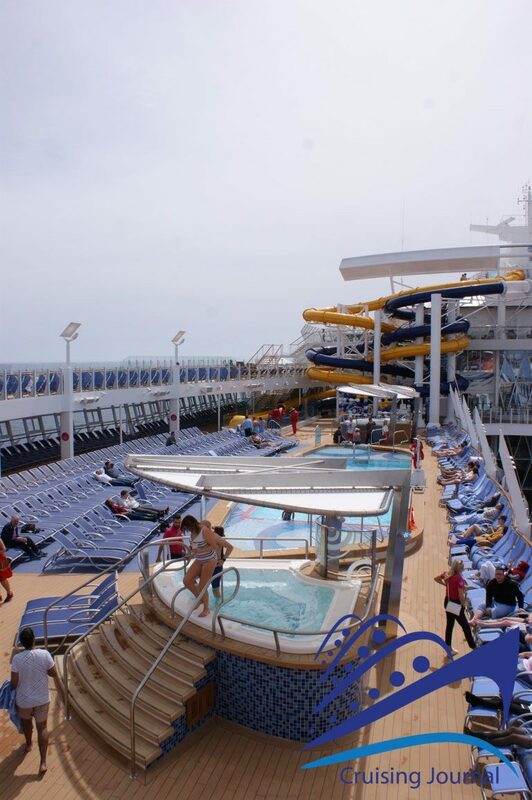 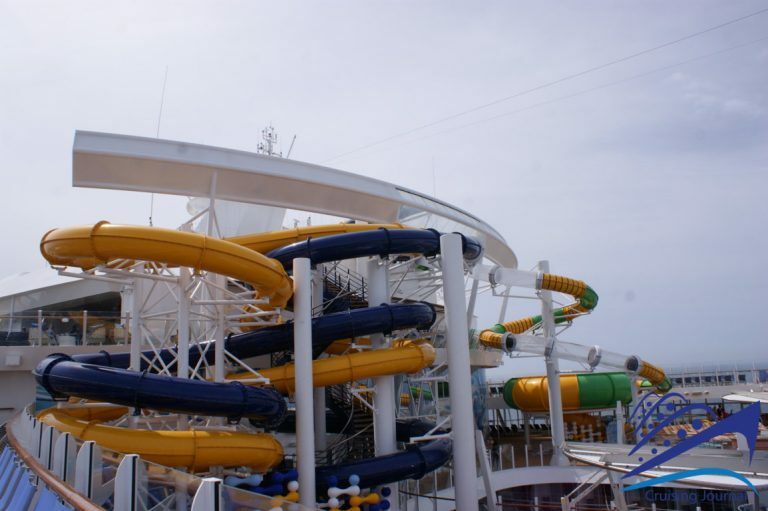 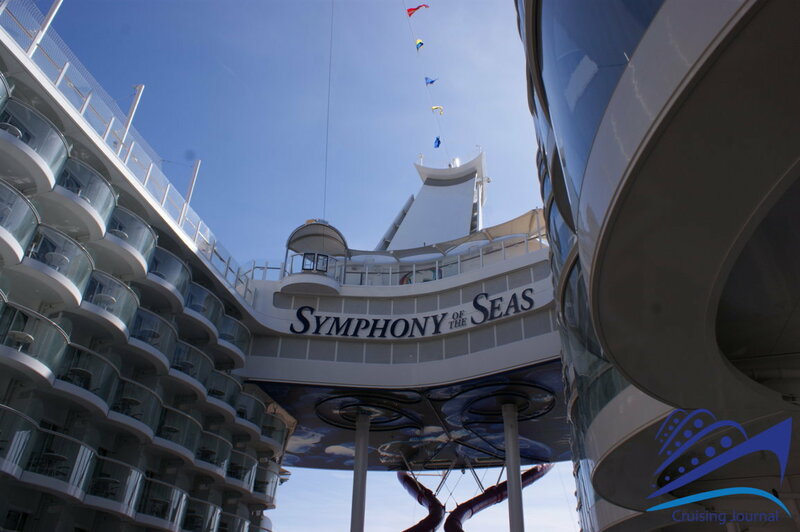 If, from there, you raise your eyes you will have a chill at the thought of sliding inside the Ultimate Abyss Slide, a steep toboggan that, from the highest decks of the ship, will literally throw you to the BoardWalk. 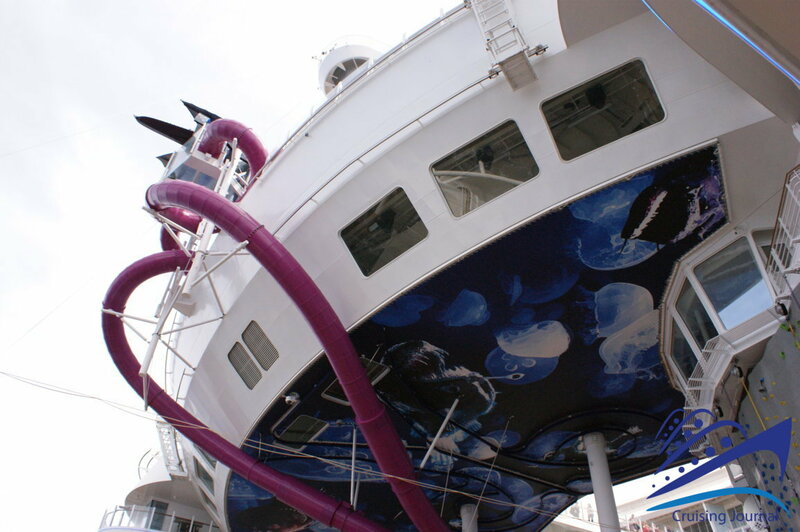 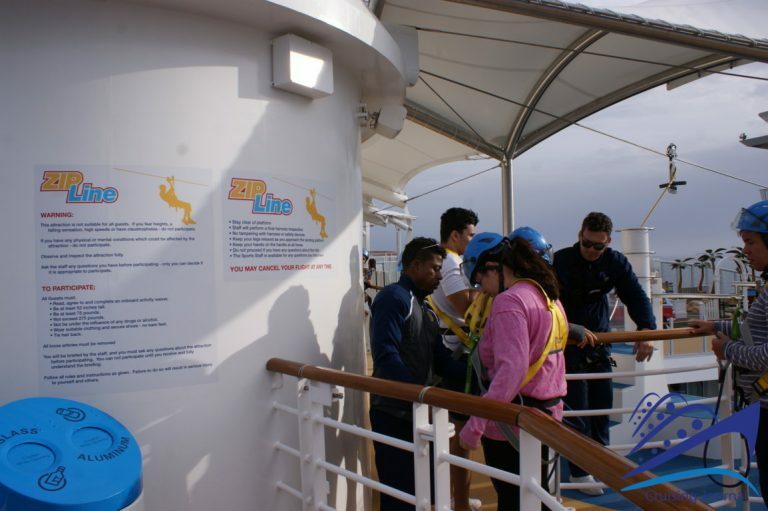 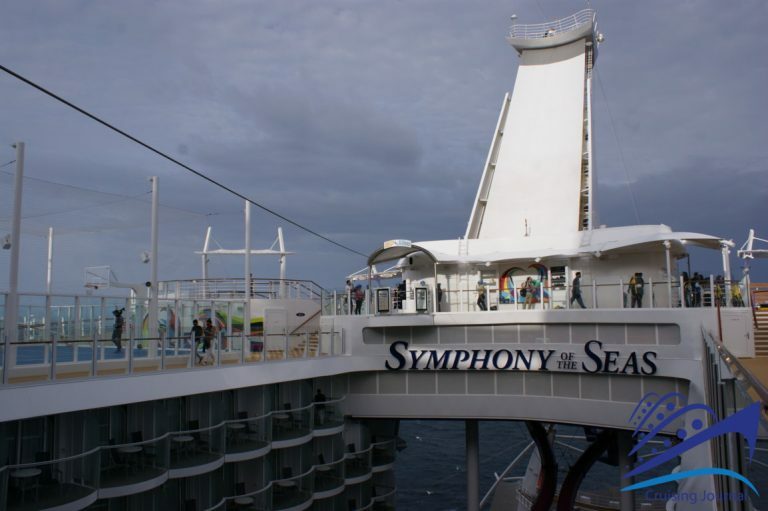 You do not have to walk much to find, on both sides of the Aquatheatre, the Rock Climbing Wall, and, above your head, you will see people jumping from one side of the ship to the other along the Zip- Line, suspended in space. 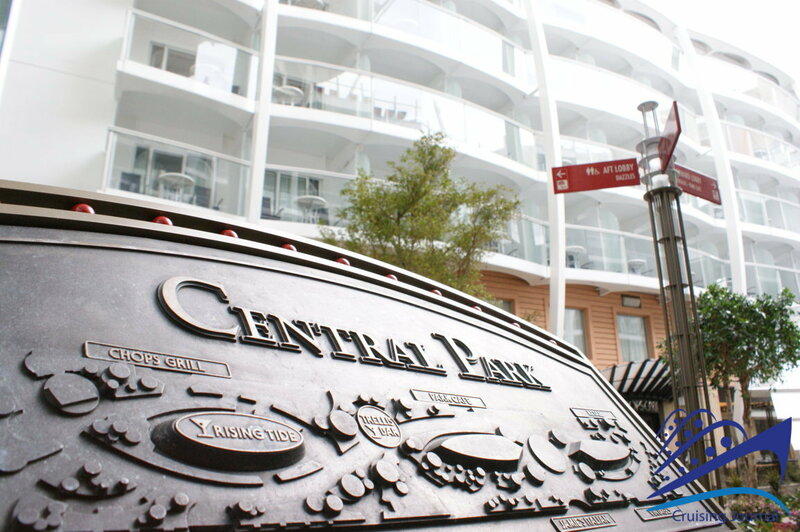 Central Park then, with thousands of plants, which hide benches, bars and even gnomes, will amaze you… A corner of true green nature in the middle of the sea, which makes this area truly unique and special, from early morning to evening. 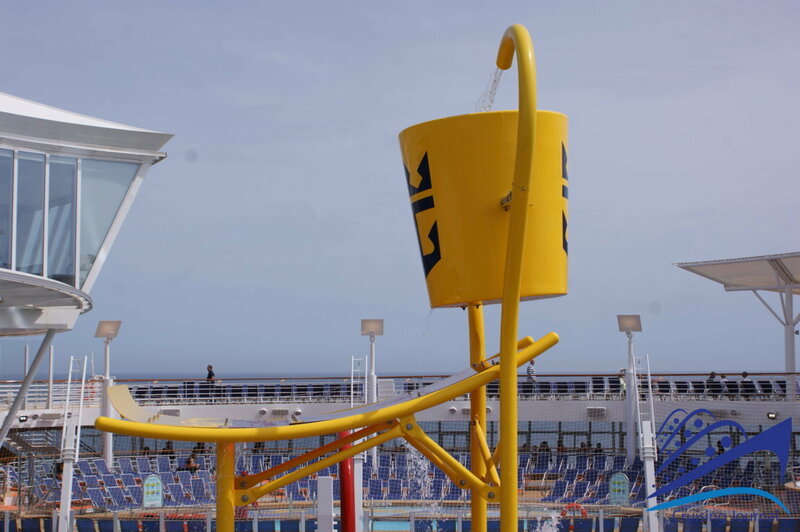 The same “WOW” effect is also offered by the two FlowRiders at the stern of deck 15, where you will learn how to surf real big waves, and also by the Beach Pool, a sort of beach with sun loungers and umbrellas “on the shore” gently sloping towards the water. 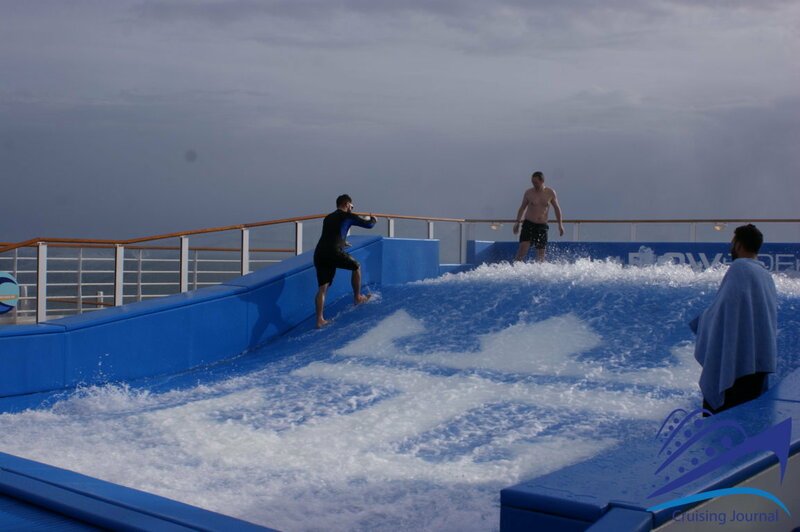 The Perfect Storm Waterslides is then the water attraction par excellence: a series of toboggans and water games developing from deck 15 to the bow on deck 18. Finally, Symphony of the Seas will give you the chance to admire a suggestive ice skating show in the heart of a transatlantic. 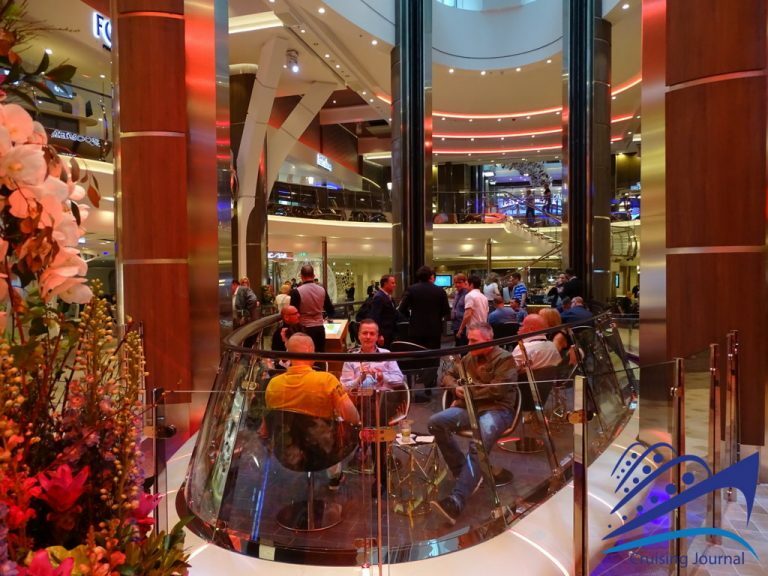 At the Center Ice Rink, in fact, you can actually skate on a real ice rink. 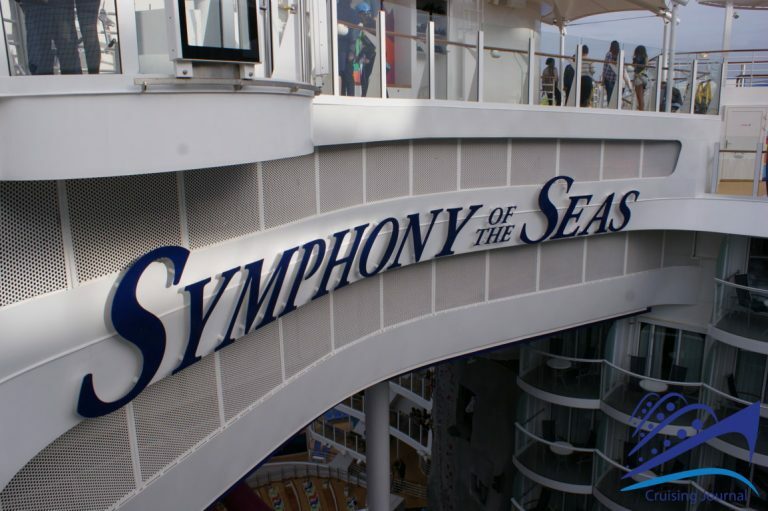 As already mentioned, the size is not the only thing that makes Symphony of the Seas a truly unique ship. 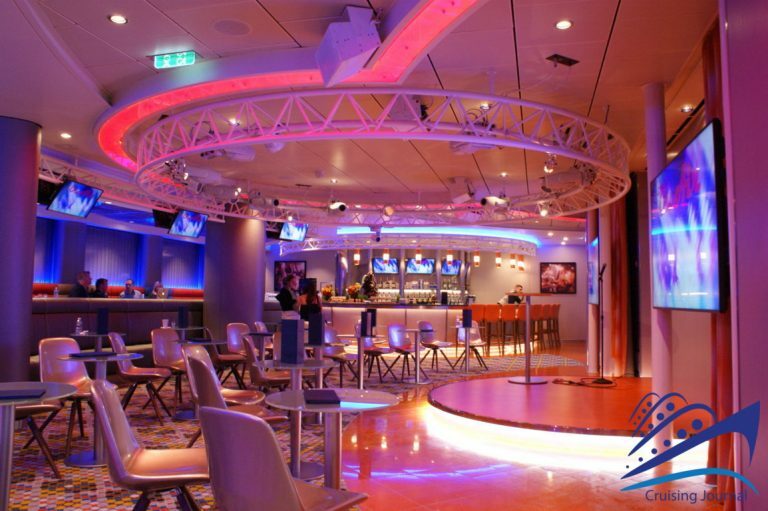 There are many entertainment services and bars, where you can listen to the most different types of music, whether you love dancing or you just want to relax. 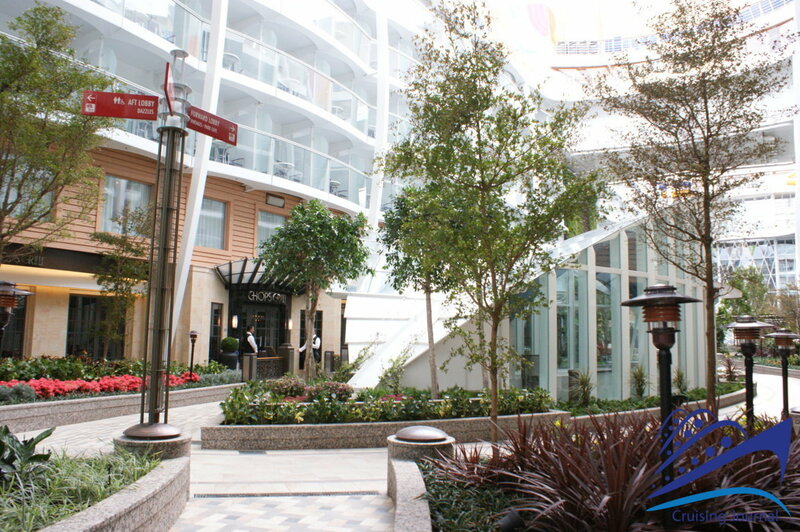 The Royal Promenade itself is a real avenue full of places where to spend your time, from breakfast until late at night. 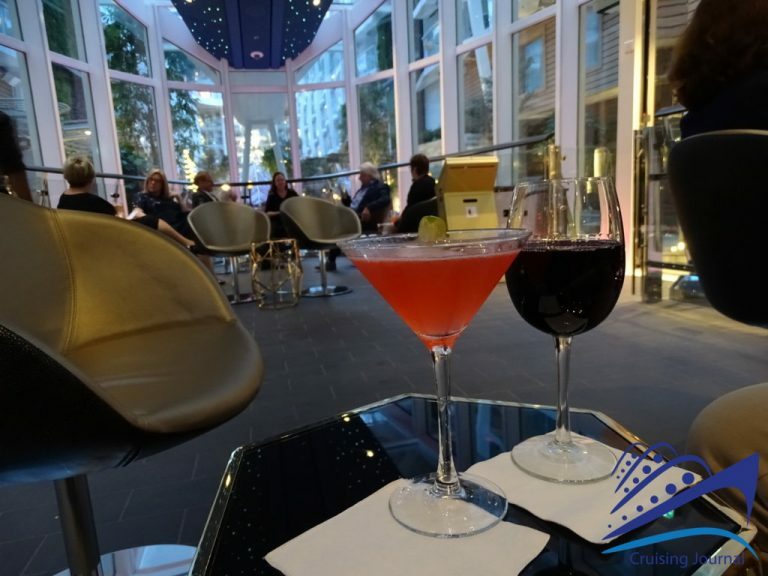 Walking from the majestic Royal Theater, at the bow, we find Boleros, the kingdom of Latin American music, and, in front of it, the modern On Air Club, often offering Karaoke nights. 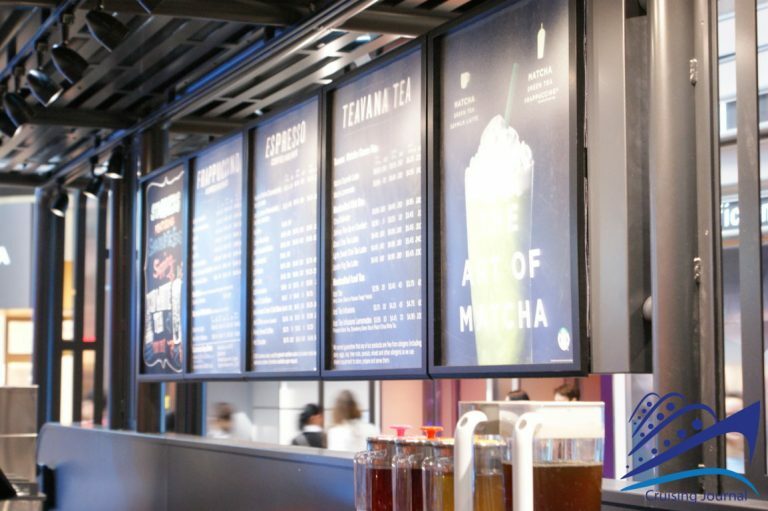 Starbucks, the icon of the American coffee, with its many varieties of cappuccino and other really delicious specialties, is just between them. 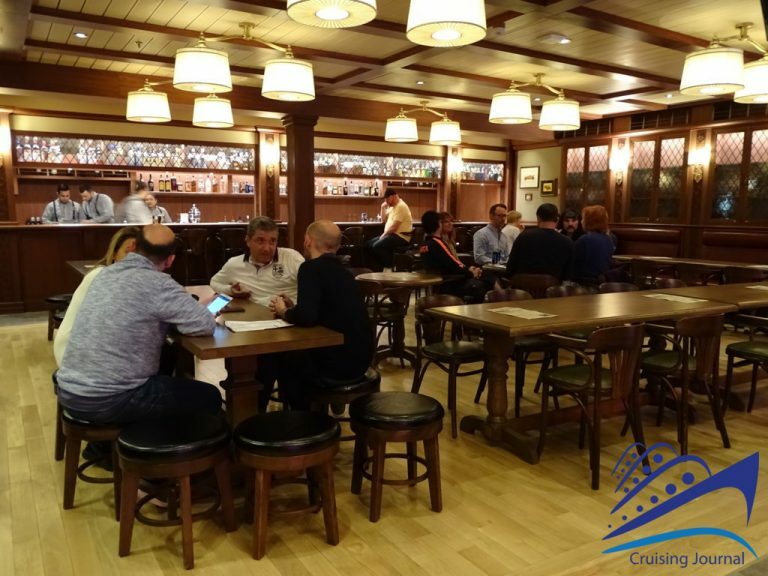 Walking on the Promenade, then, you will find the pizzeria, Sorrentos, a busy place where to taste delicious pizza, and the English Pub, with an outdoor area equipped with tables and an indoor cozy room. 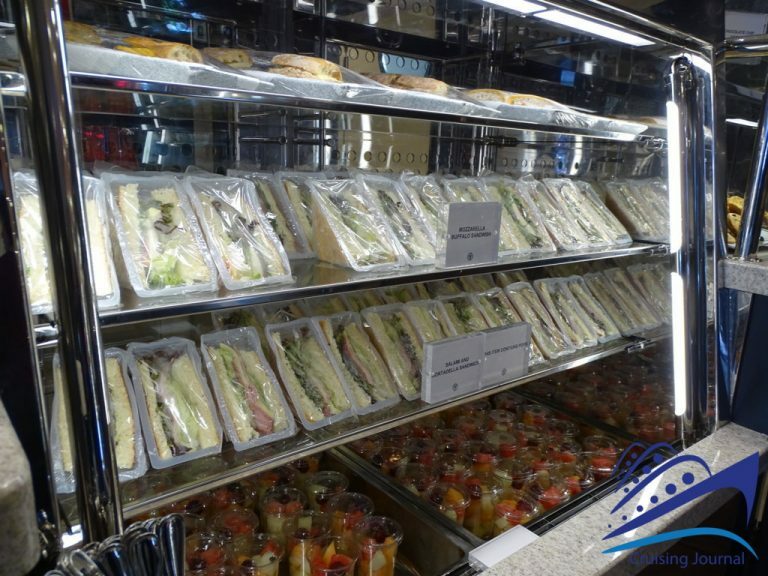 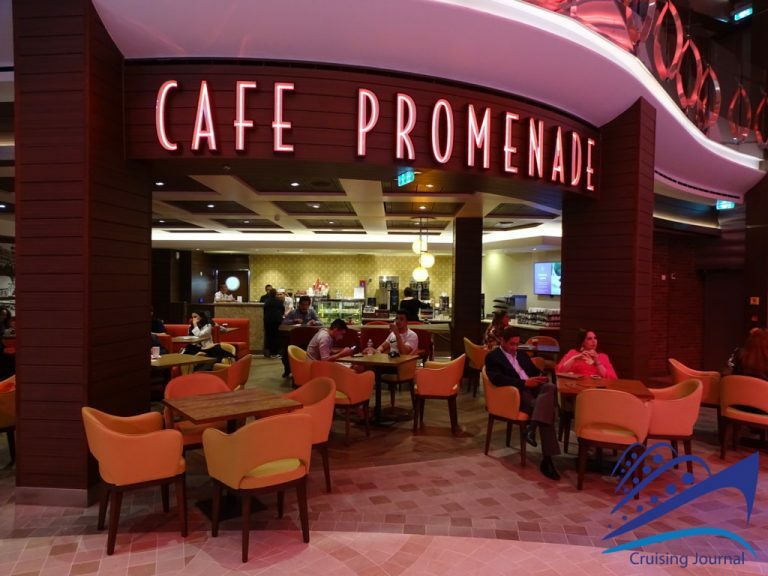 A little further on, Promenade Cafe is the reference point for those who eat at any hour, since it is open 24 hours a day. 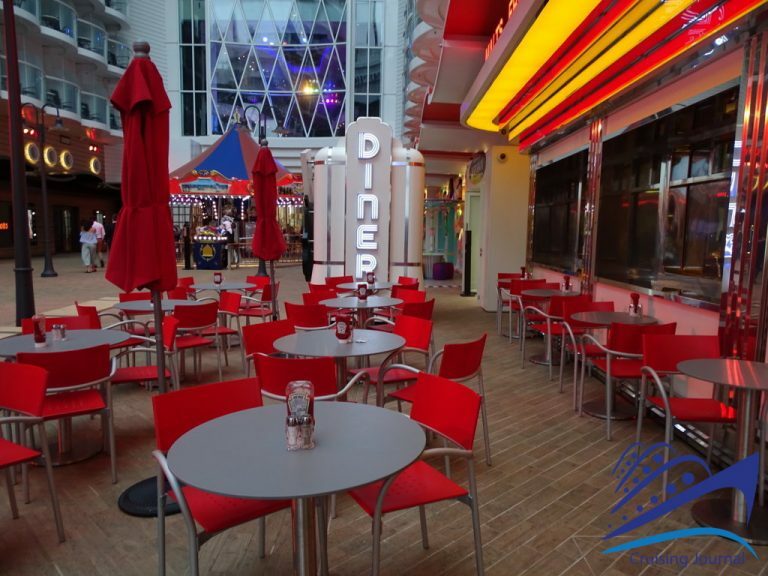 At the end of the Promenade, before reaching the main restaurant, you will find the Reception, Bionic Bar, Next Cruise and Riding Tide Bar. 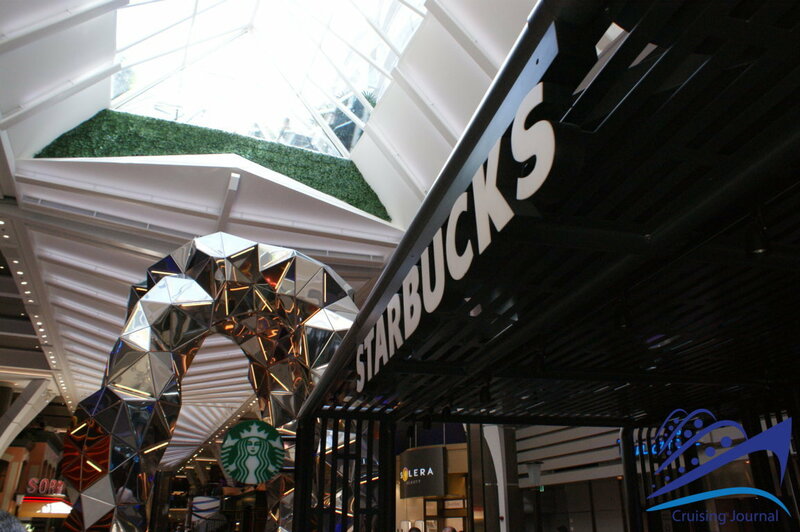 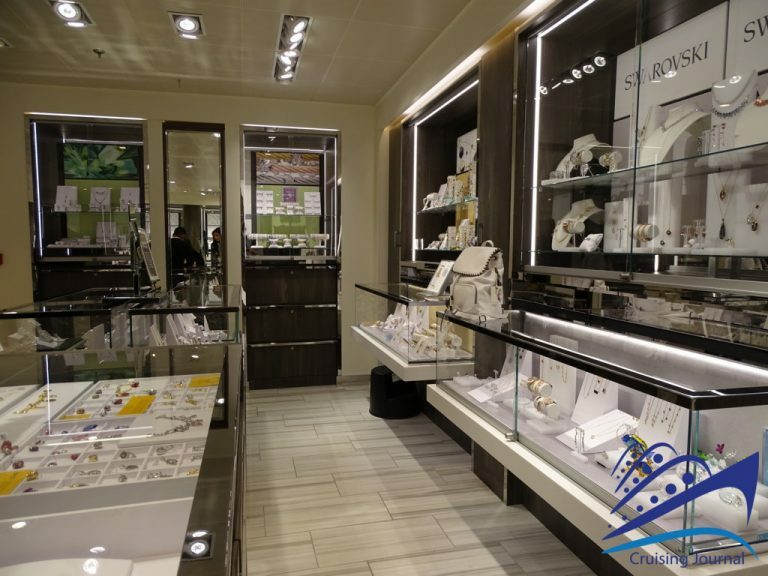 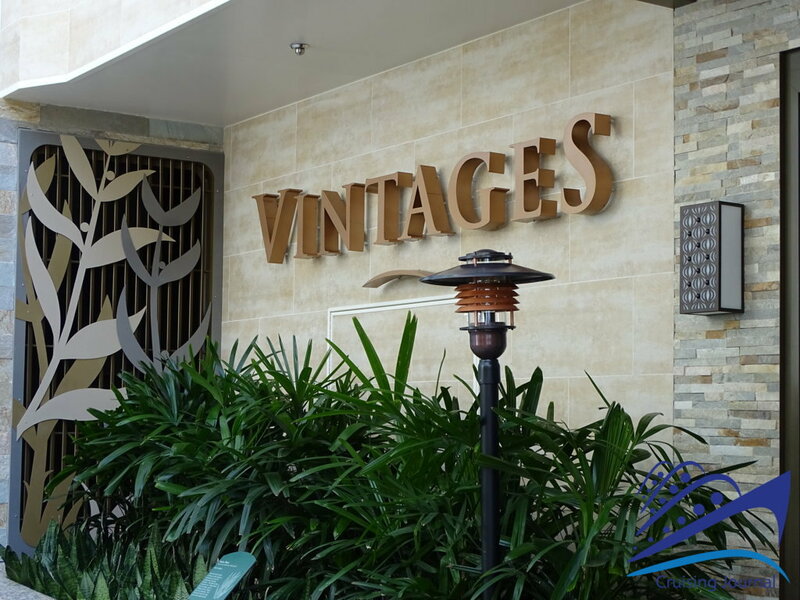 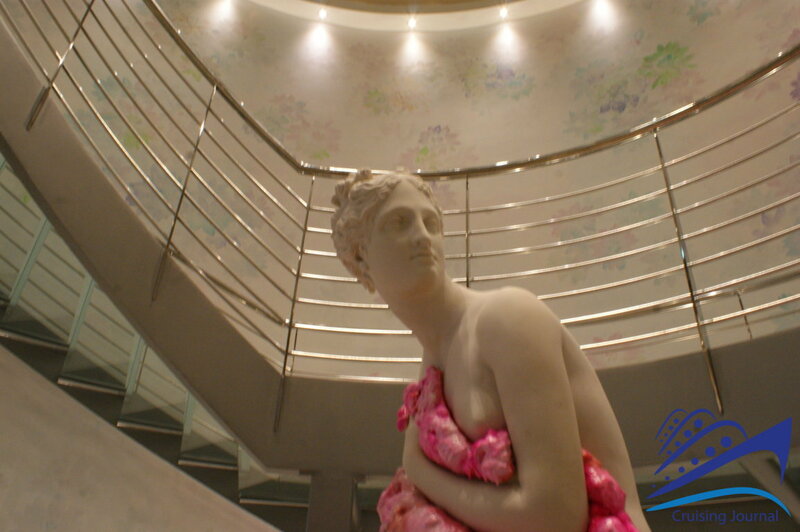 The Promenade is also the ideal place for shopping, although some exclusive boutiques are also located in Central Park. 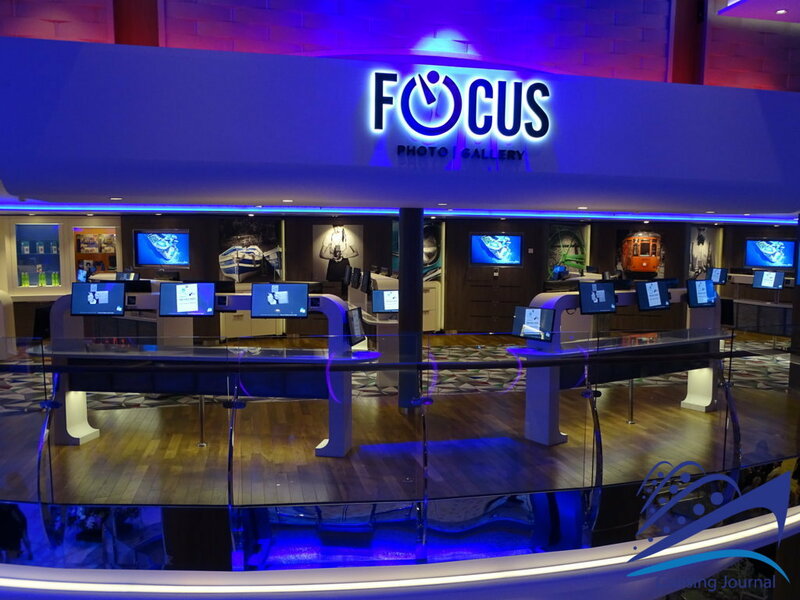 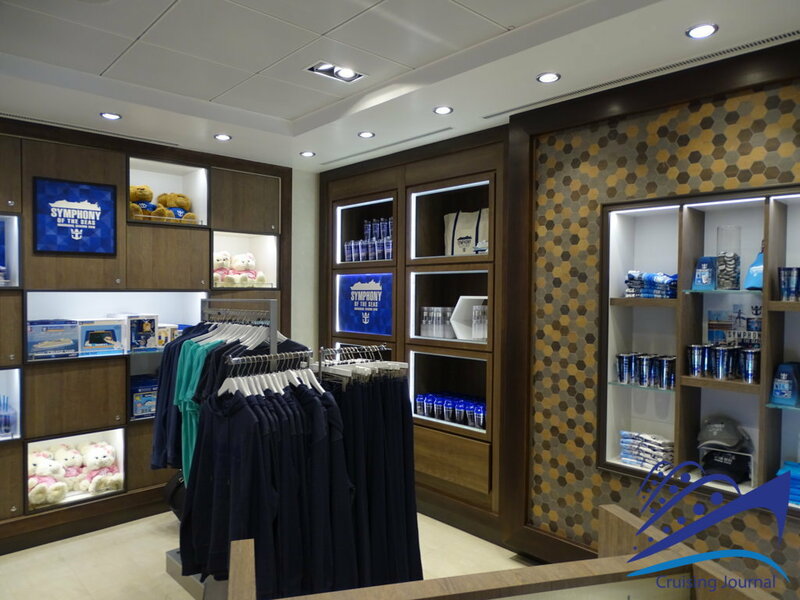 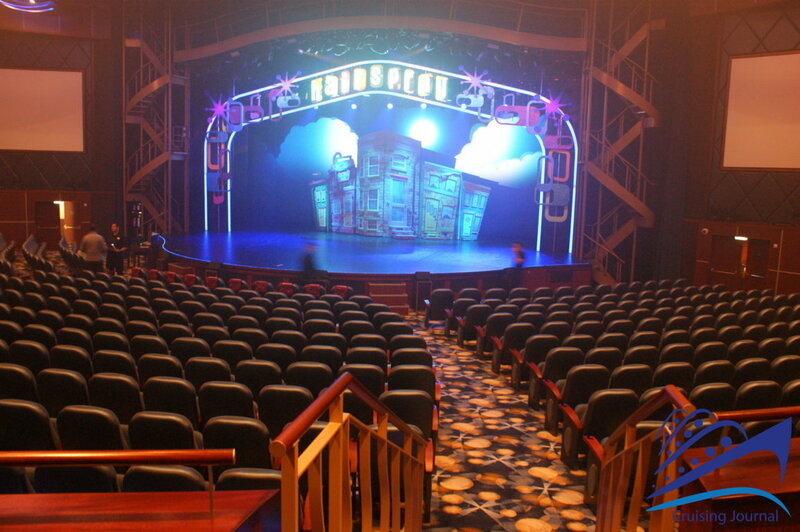 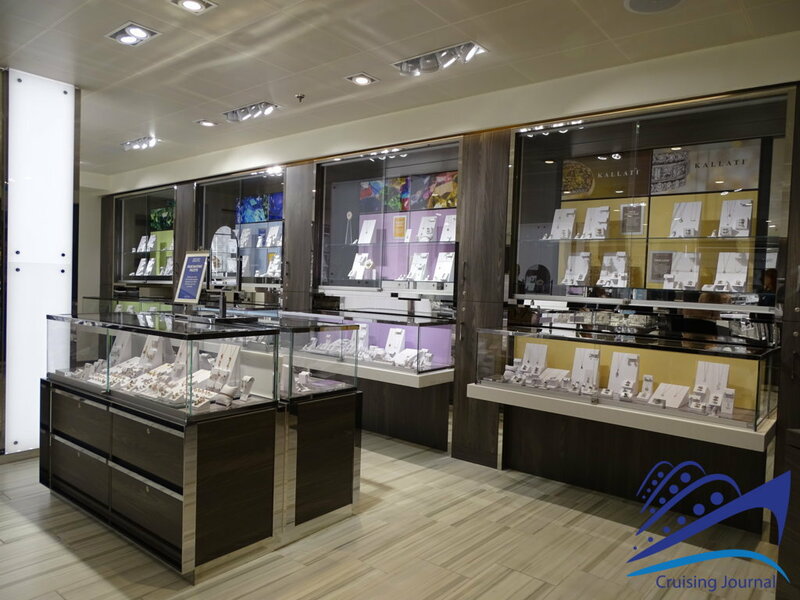 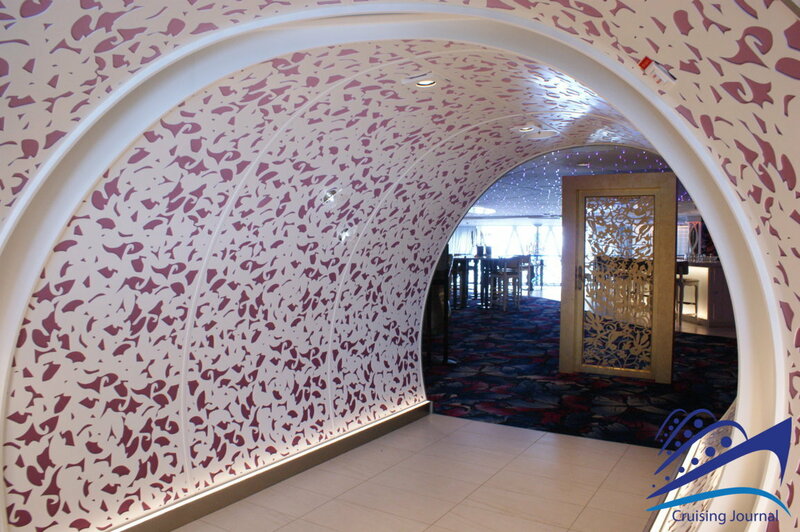 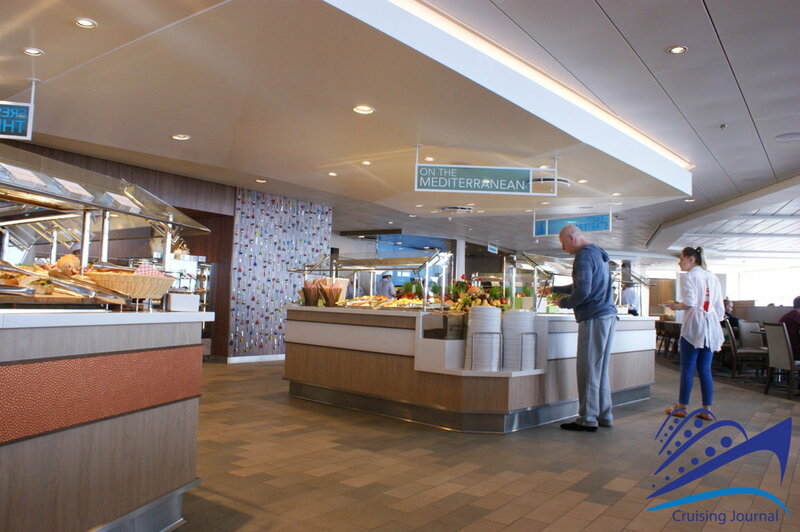 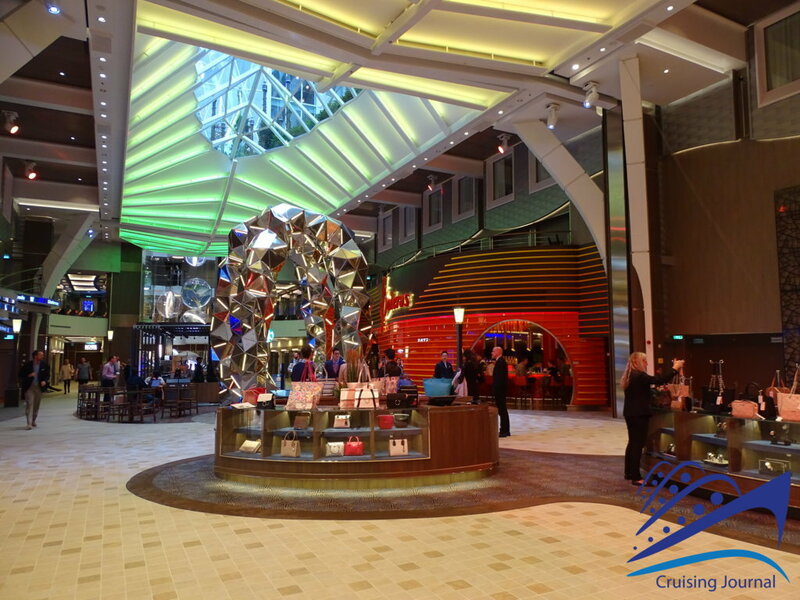 Other facilities are located at deck 6, overlooking the Promenade: the Tour Office, the Focus, the Picture This, that is the photo gallery, and the Loyalty Desk. 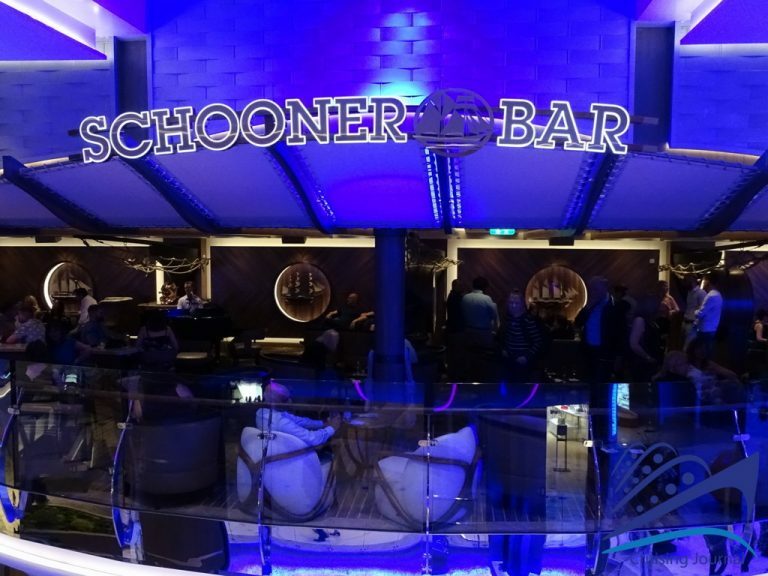 Schooner Bar is an elegant and cozy place that will make you feel like being on a large sailing ship. 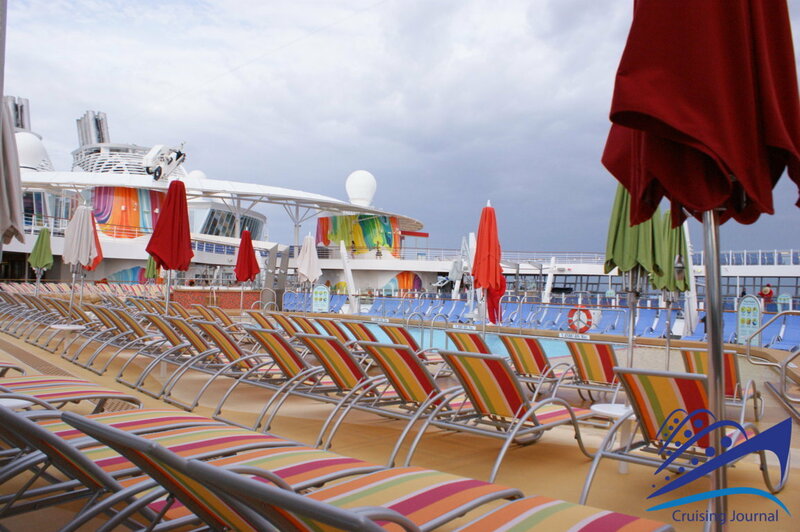 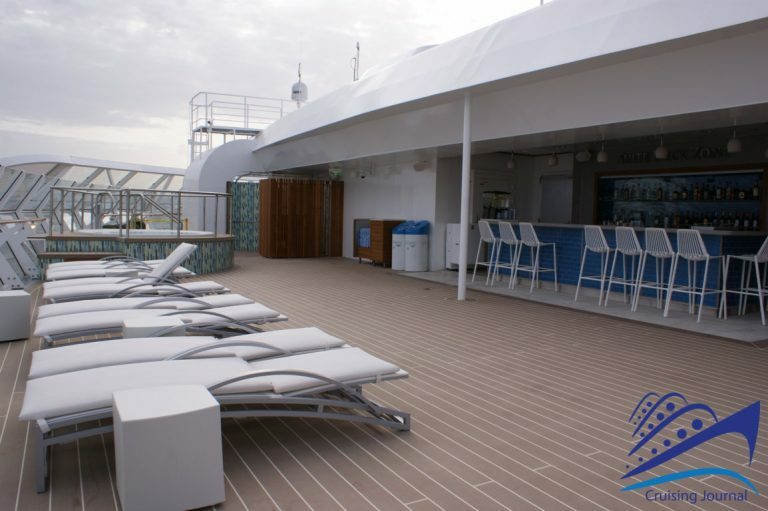 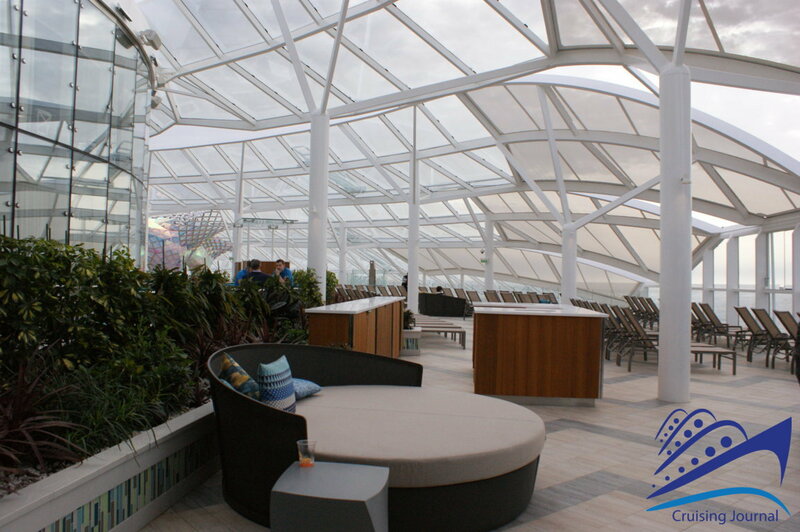 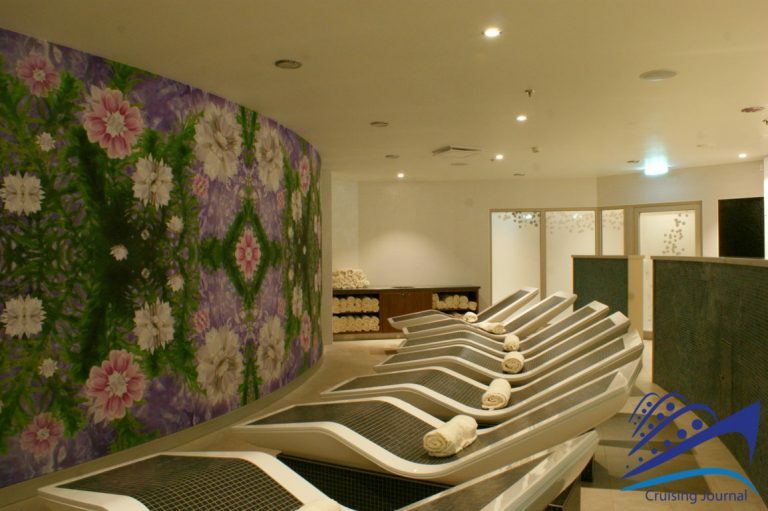 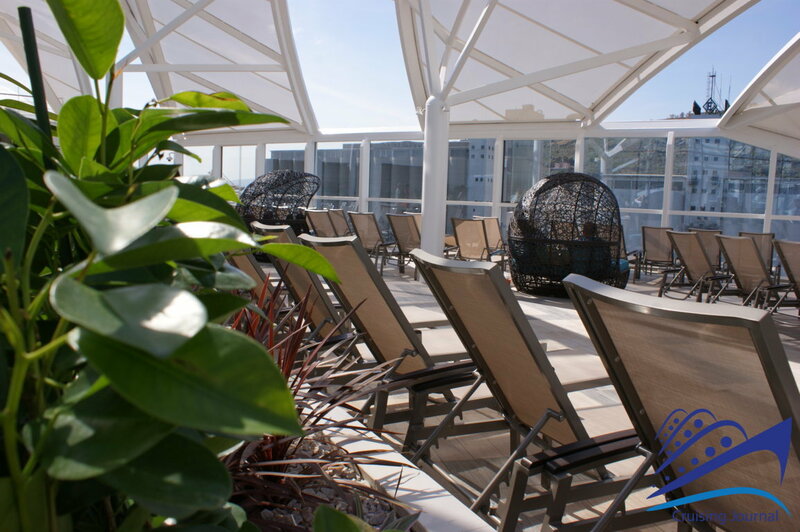 From the bow, you can access Vitality at Sea Spa & Fitness Center, which also occupies areas of the underlying deck 5. A large, modern spa that looks like a small city within the city, with Vitality Café where you can have a break from your workout or simply stop to enjoy teas and herbal teas. 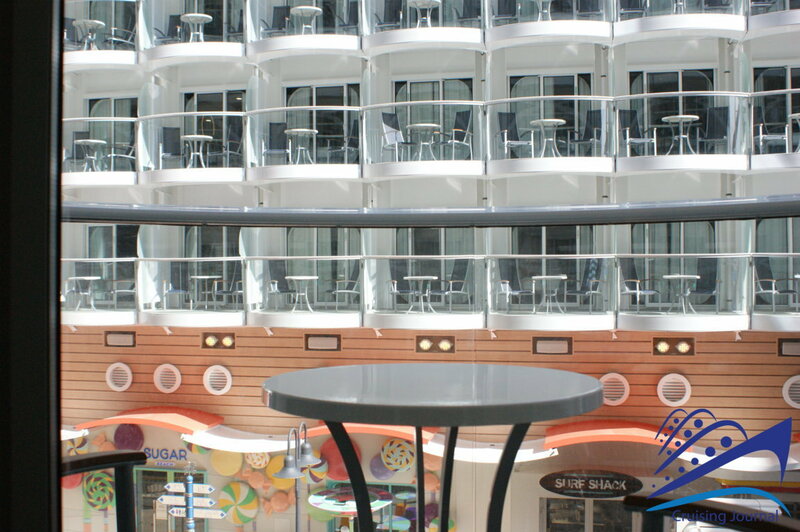 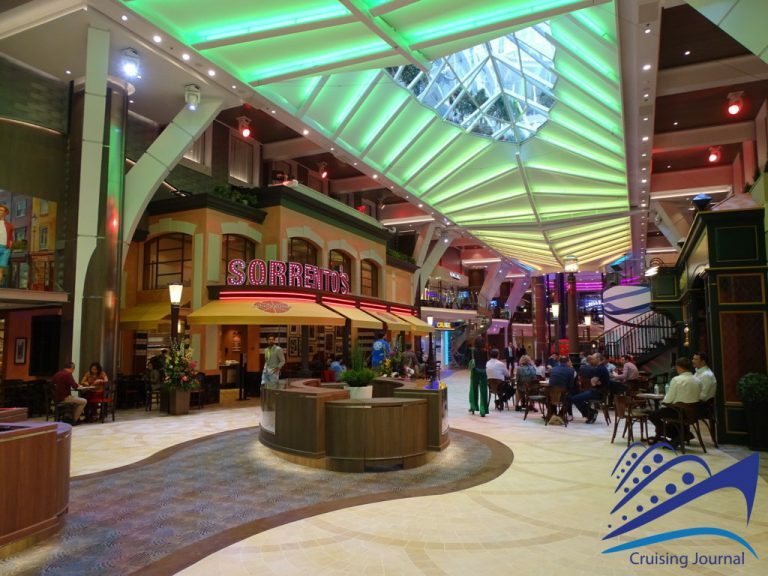 Before going up to reach the upper decks, with as many attractions and bars, let’s say something about deck 3 and deck 4, under the Royal Promenade. 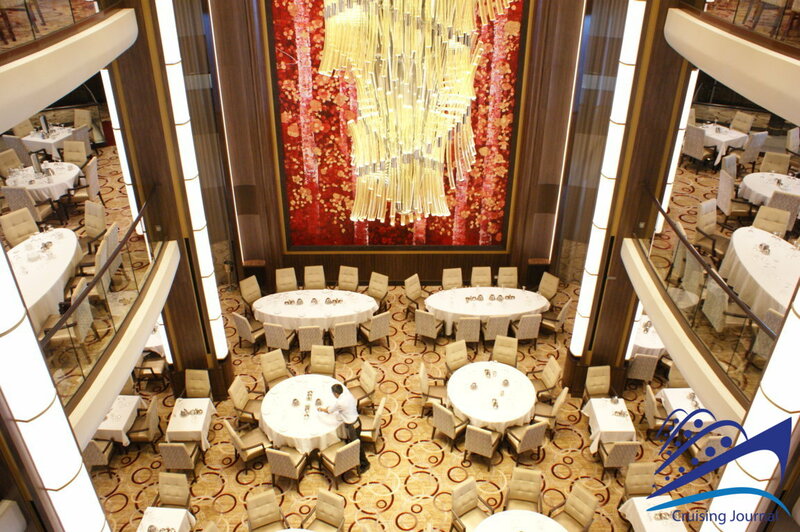 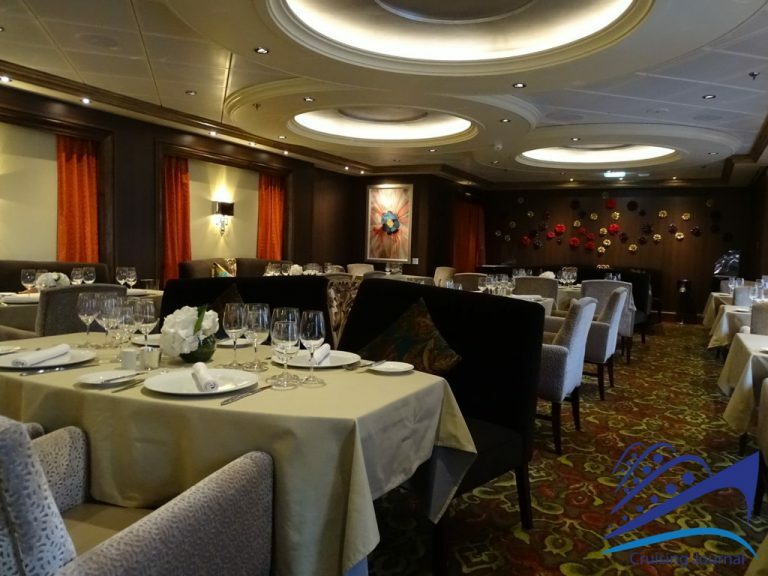 The first houses a large Conference Center and, at the stern, the lower hall of the huge Main Dining Room. 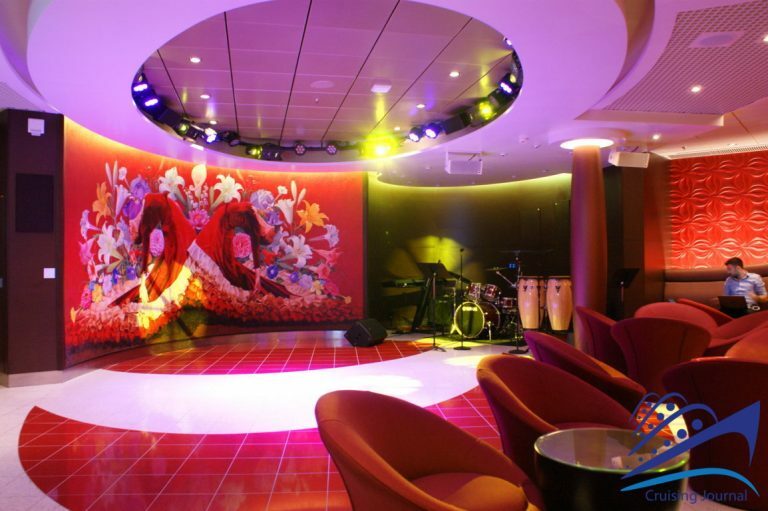 The bow of deck 4, on the other hand, houses the Royal Theatre, while, outside it, we find a disco, The Attic and a Jazz club, Jazz on 4. 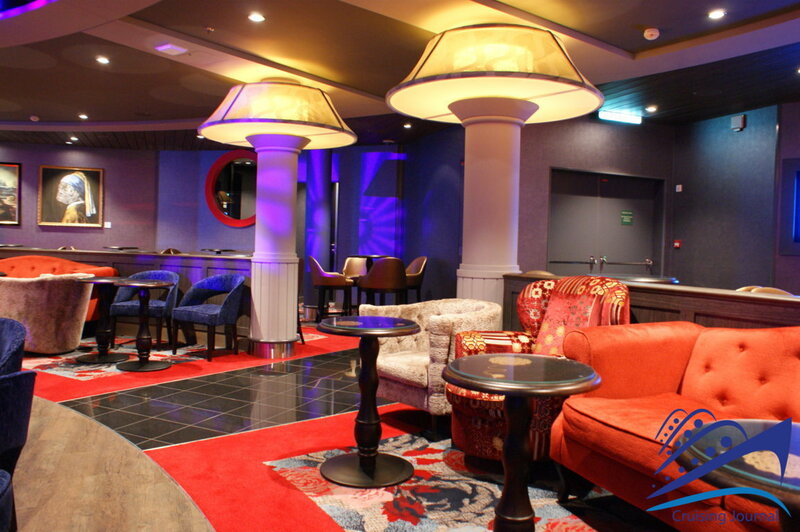 Reserved for members only, Diamond Club offers privacy and relaxation, which is an exception considering that we are in the heart of the Entertainment Place. 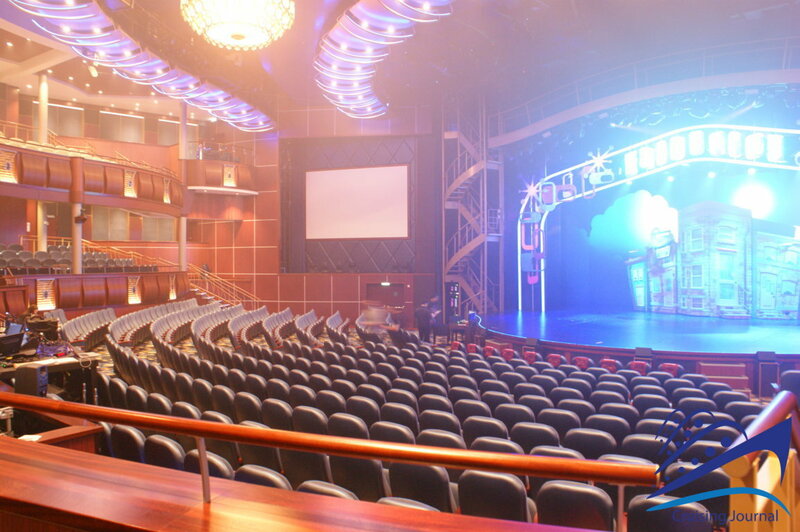 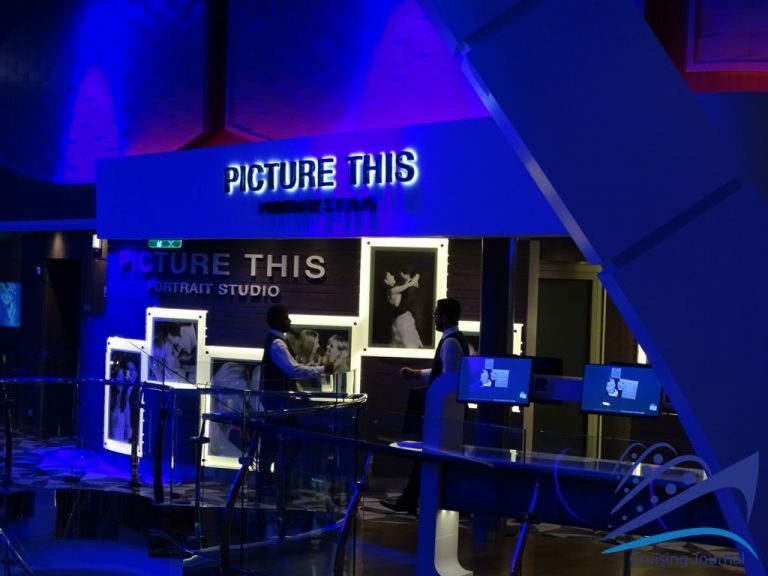 The Central Ice Rink, with StudioB, is another exclusive service offered by Royal Caribbean, and its truly sensational shows are always sold out. 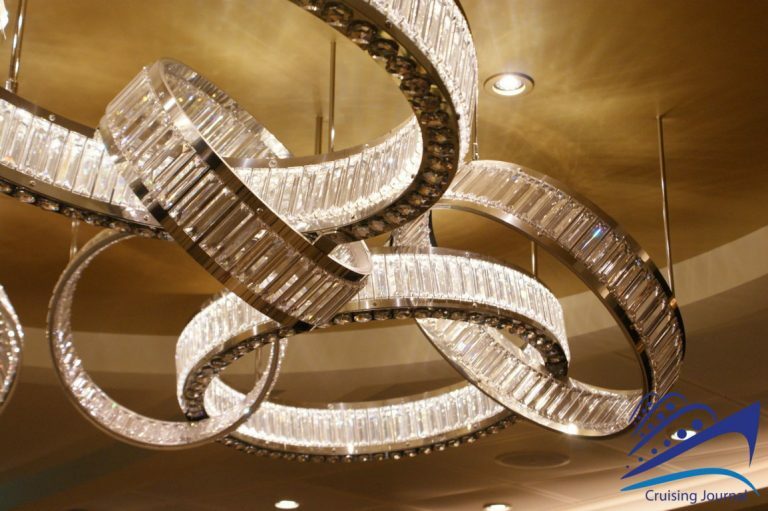 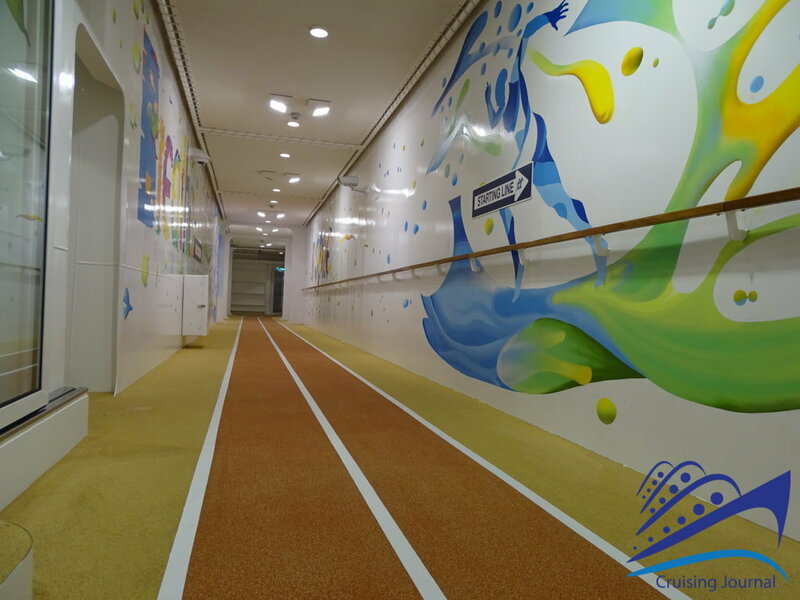 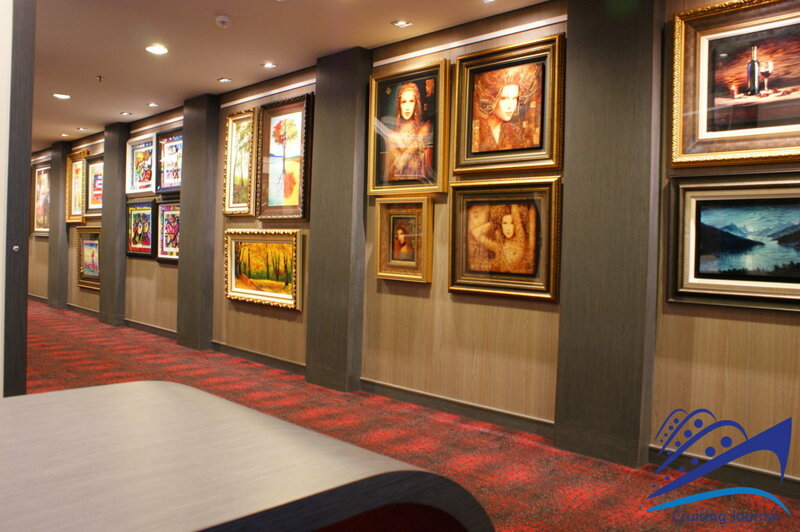 Two corridors on both sides of the Central Ice Link are decorated with paintings and other works from the Art Gallery, and lead to the majestic Royal Casino, which is a real little Las Vegas, and a fun entertainment place not just for hazard lovers. Indeed, it also features a central bar equipped with tables and armchairs and is quite busy at night. 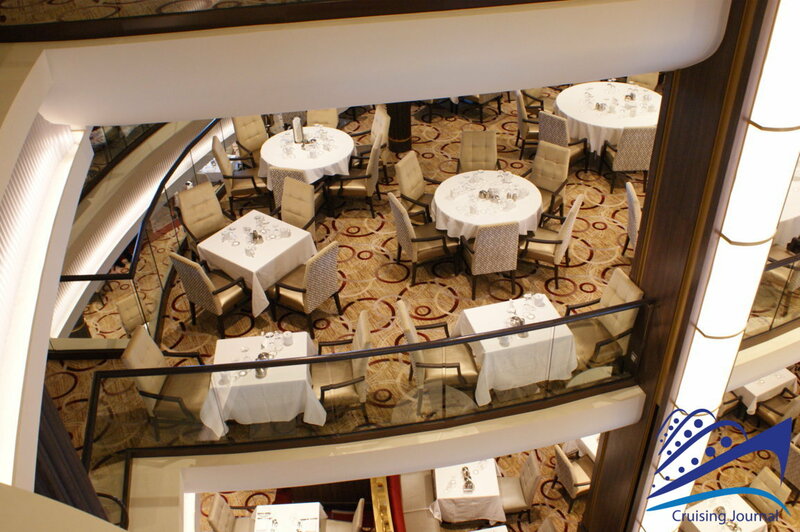 The stern, then, is occupied by the intermediate floor of the Main Dining Room. 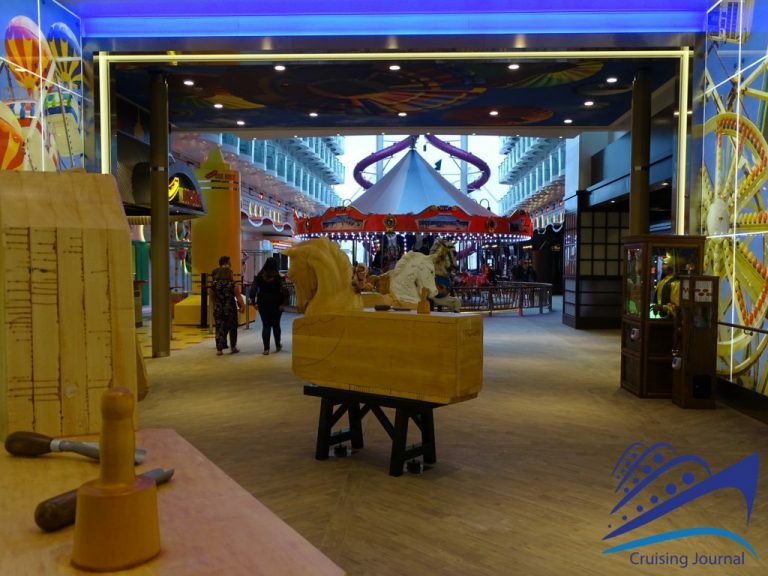 The BoardWalk, at deck 6, in addition to the spectacular horse Carousel, houses shops (including Sugar Beach, for real gourmands), restaurants and many video games. 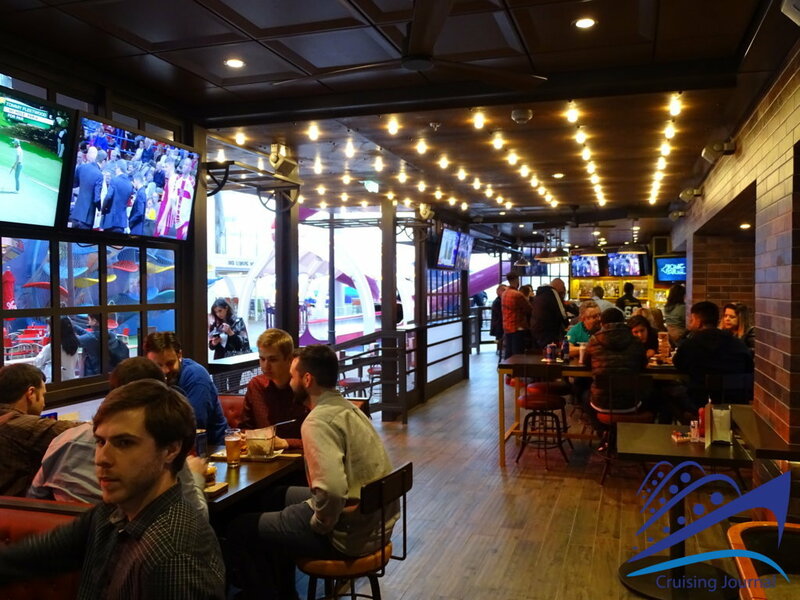 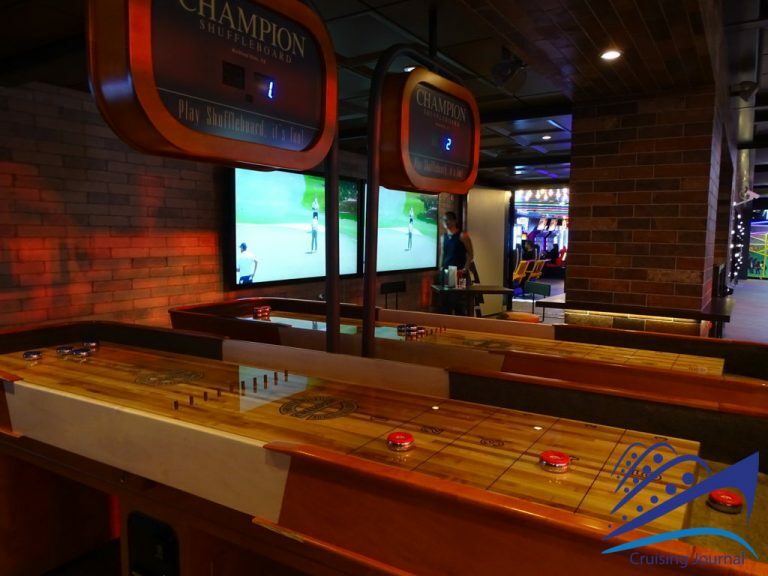 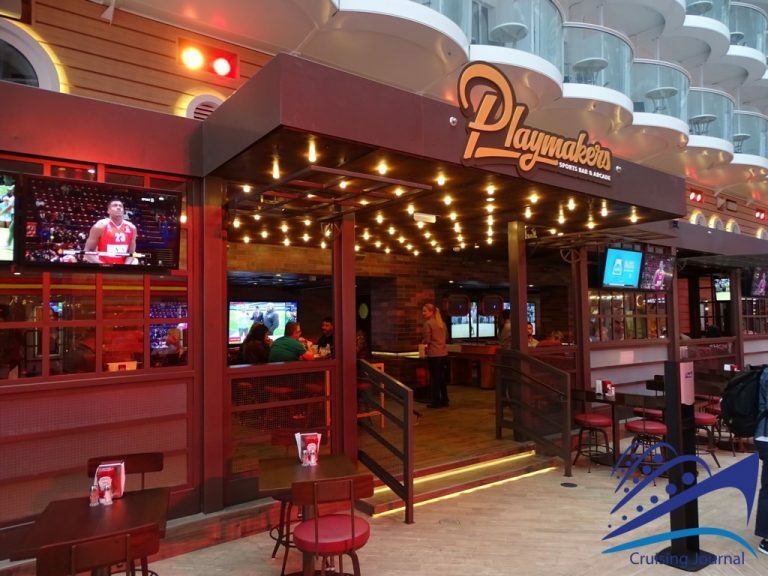 Playmakeers Sportsbar & Arcade is the perfect place for tasting chicken wings and other specialties while watching sports programs or playing with friends. 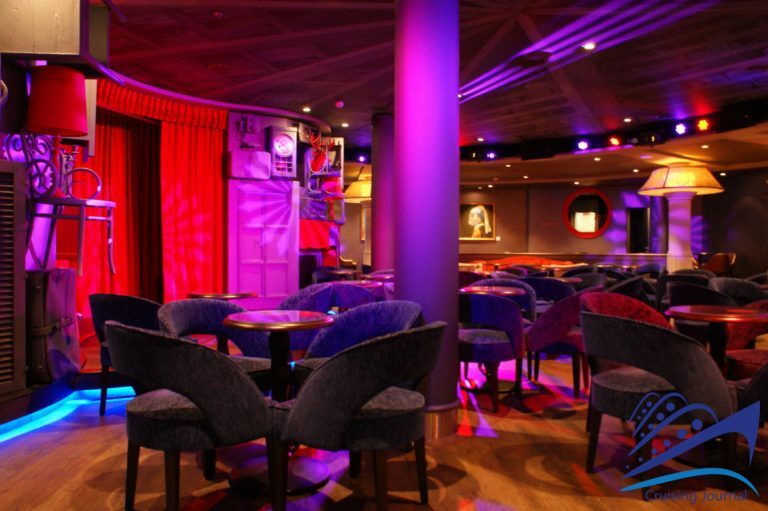 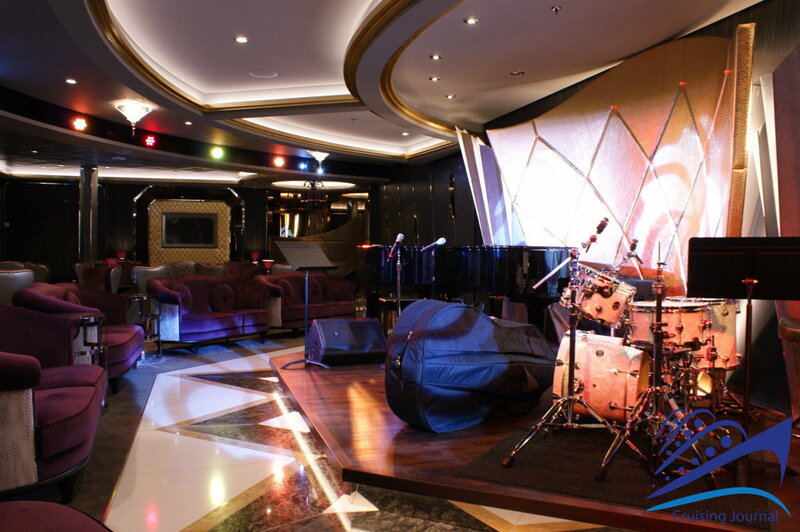 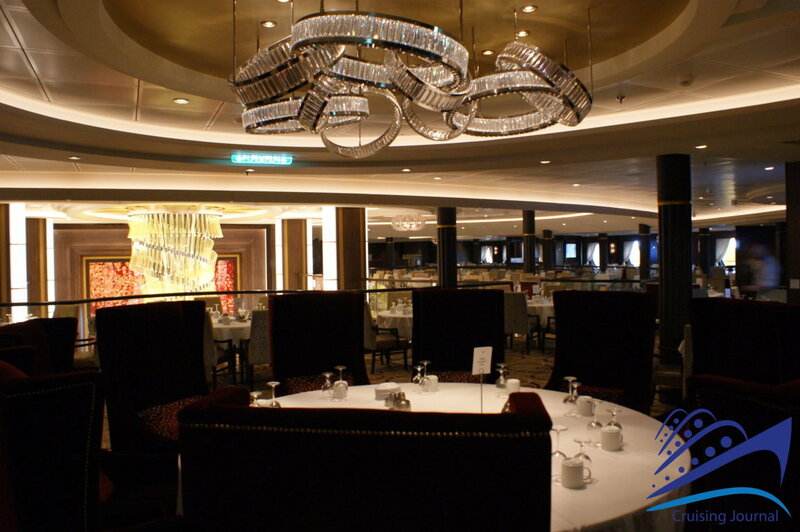 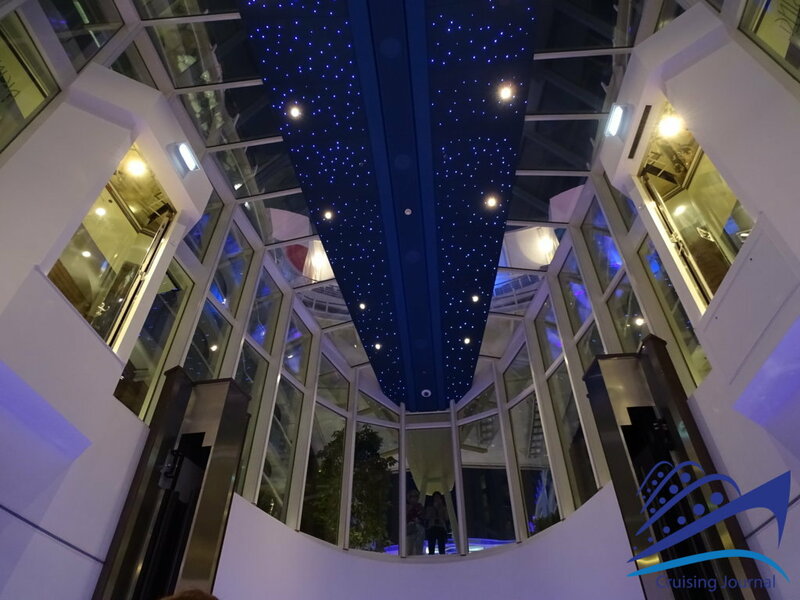 Decks 8 and 9, at the stern, are occupied by Duzzles, an elegant place that offers live music nights and turns into a fashionable after-dinner venue. 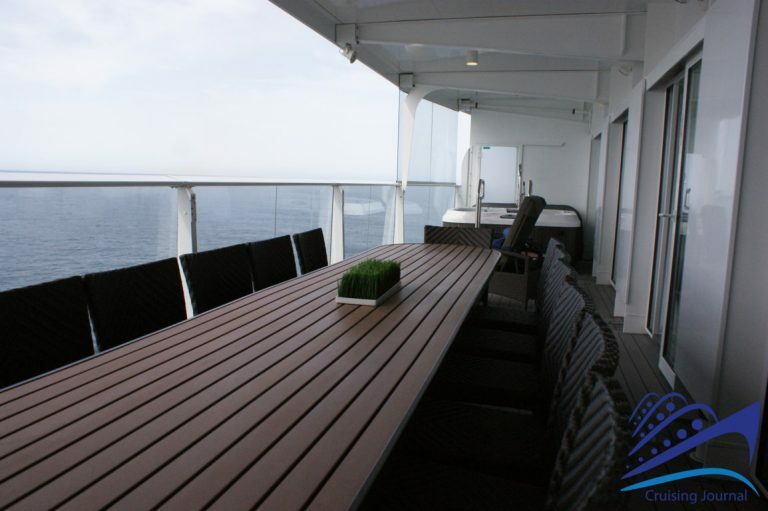 The large window on the BoardWalk offers stunning views of the decks. At deck 14, we find areas equipped for young people, such as Adventure Ocean, and the Medical Centre, at the bow, while, at the stern, the Card Room, which is also a meeting room. 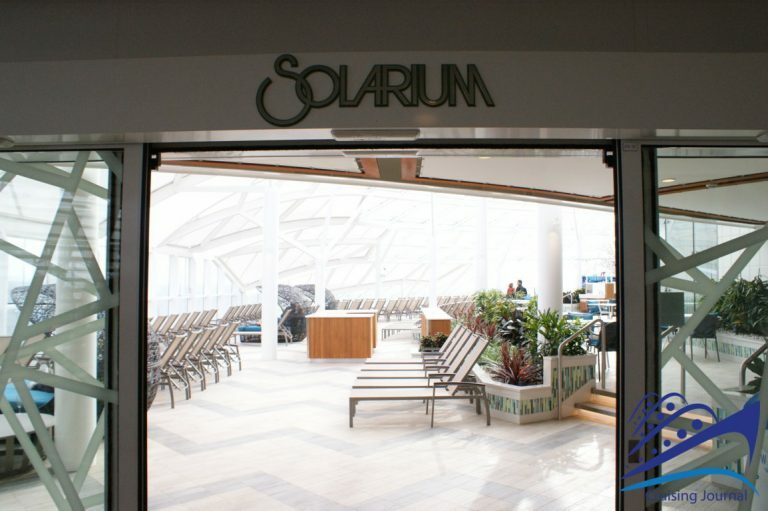 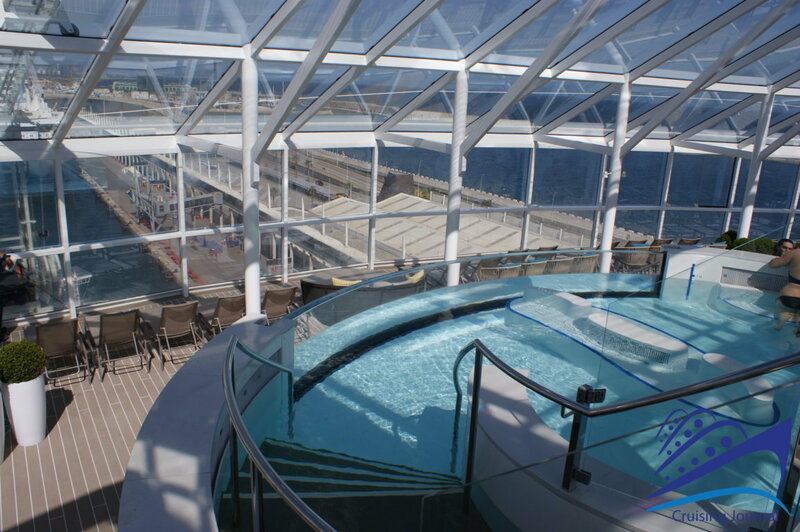 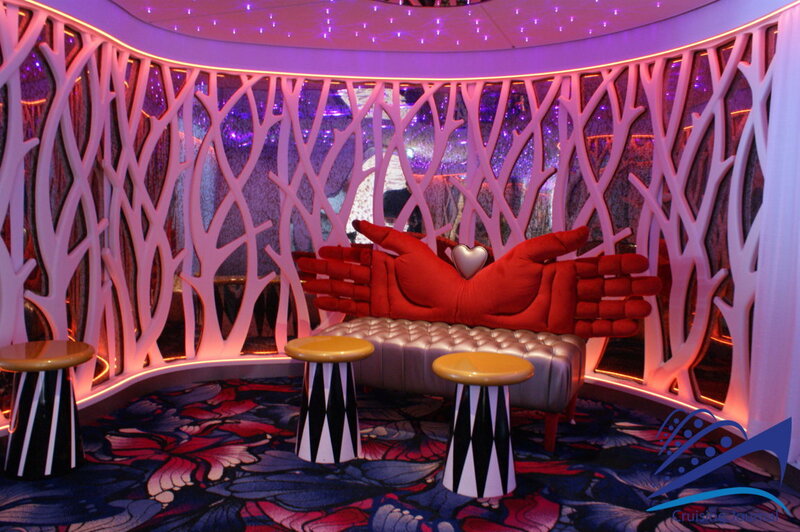 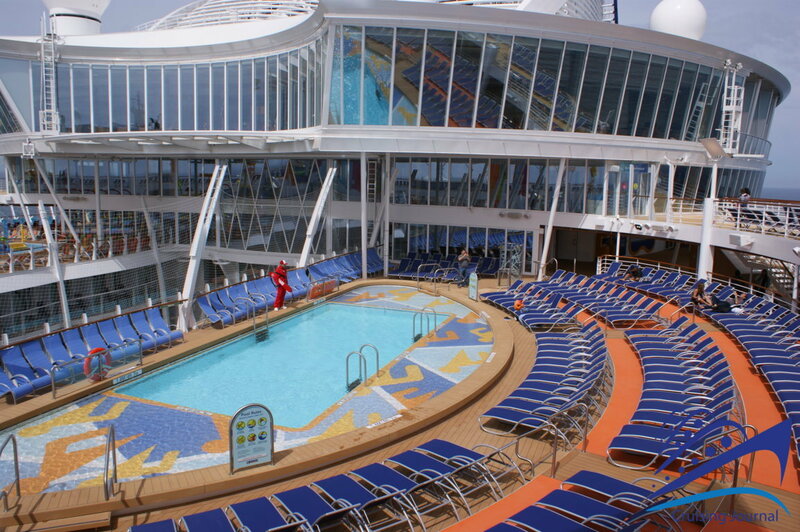 Going up, at deck 15, we find the lovely Solarium, at the bow. 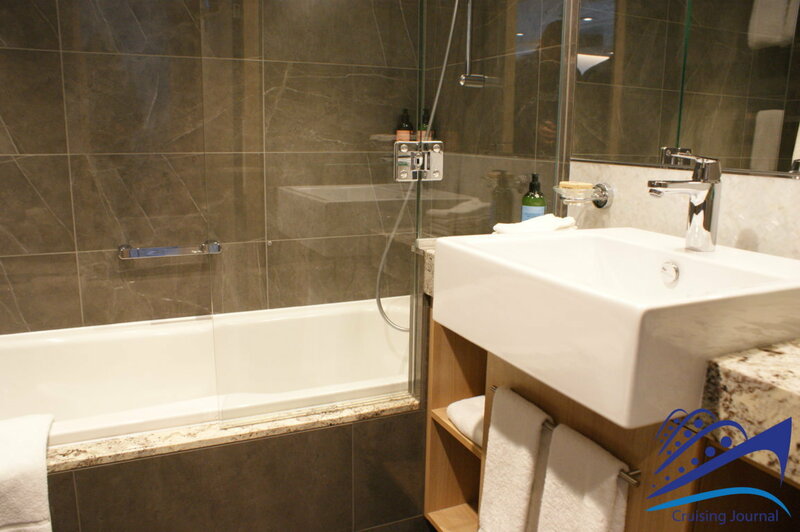 A bright, modern place, with many areas where you can relax and Jacuzzis, that offers full views of the bow. 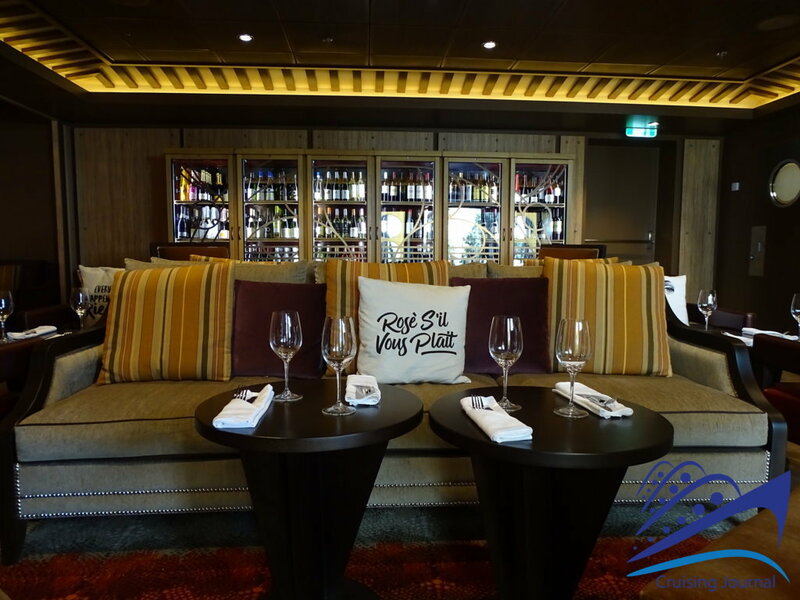 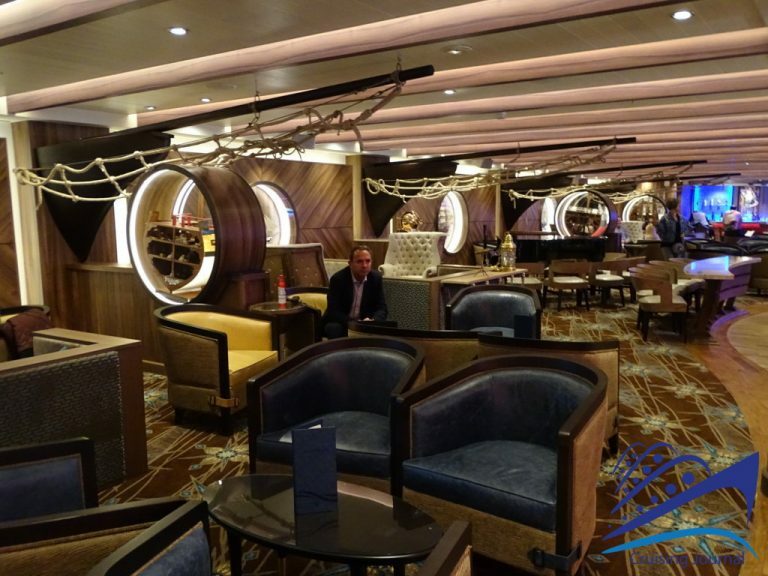 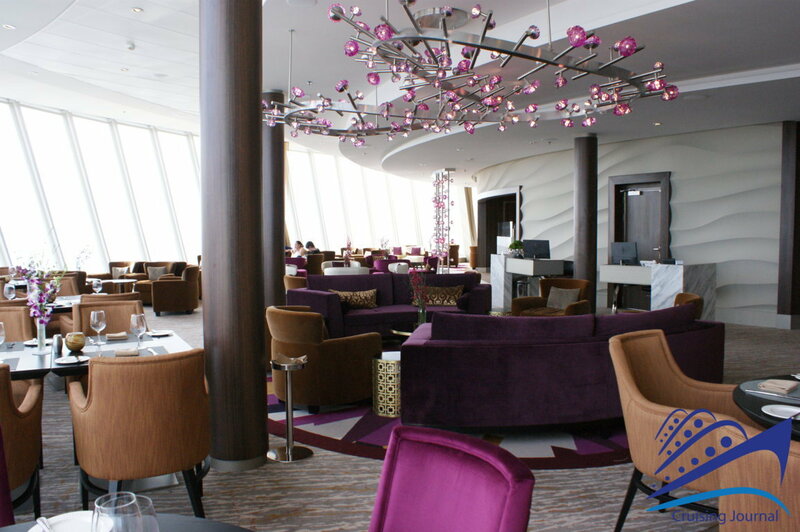 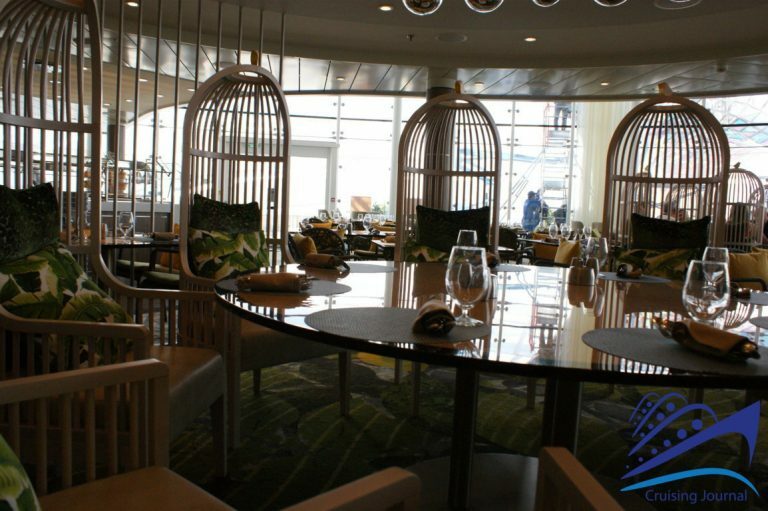 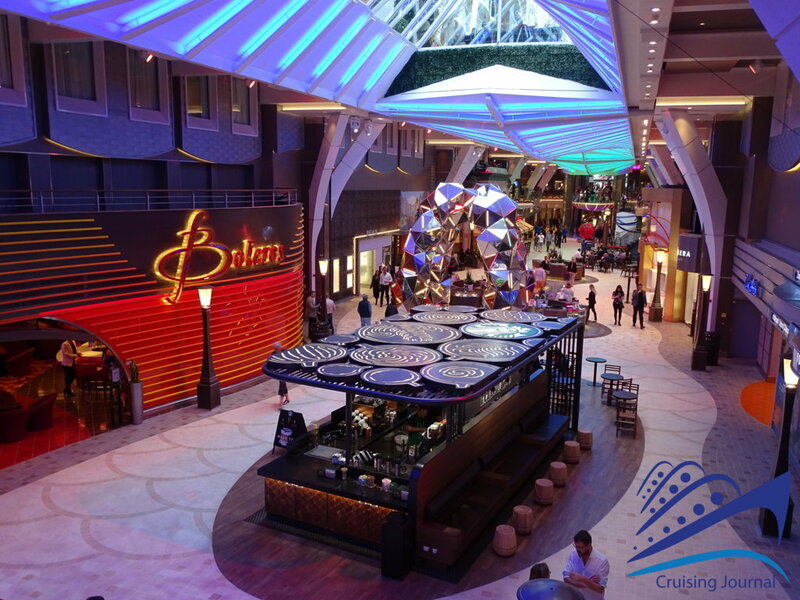 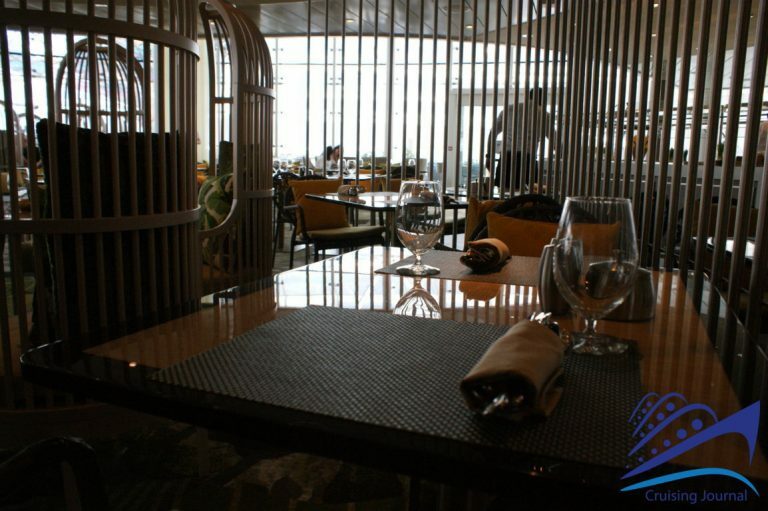 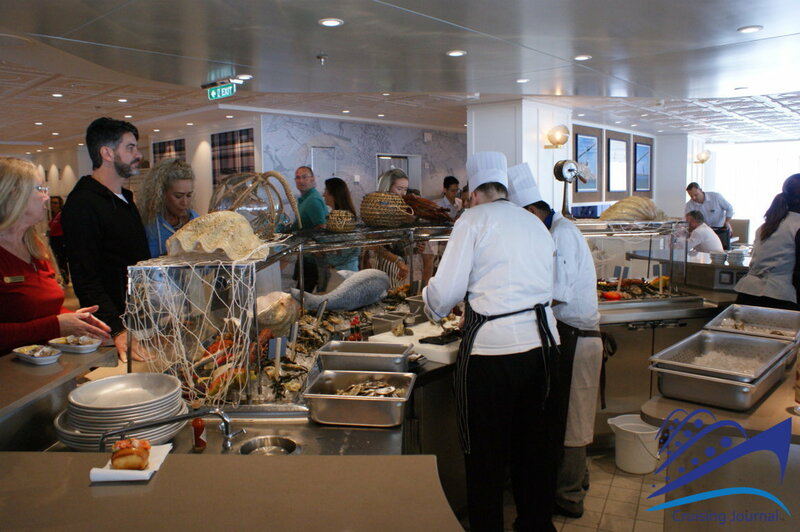 The area is served by Solarium Bistro and Solarium Bar, and also covers part of the underlying deck, deck 14th, with lovely views of the bow. 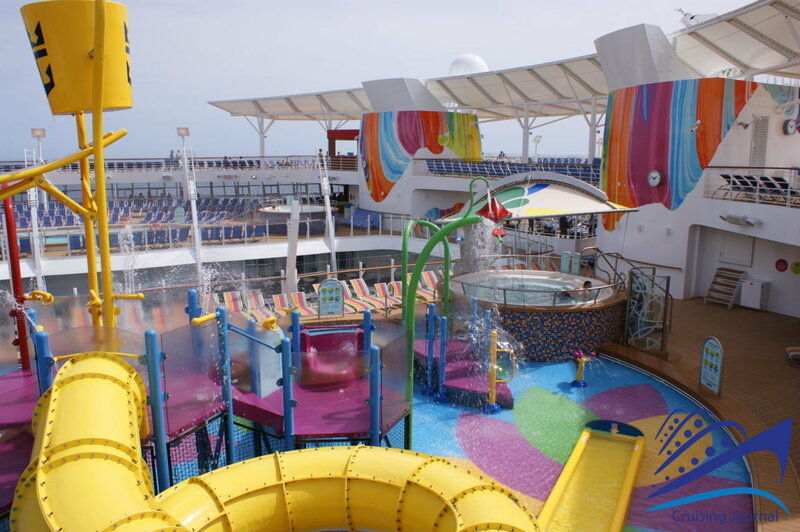 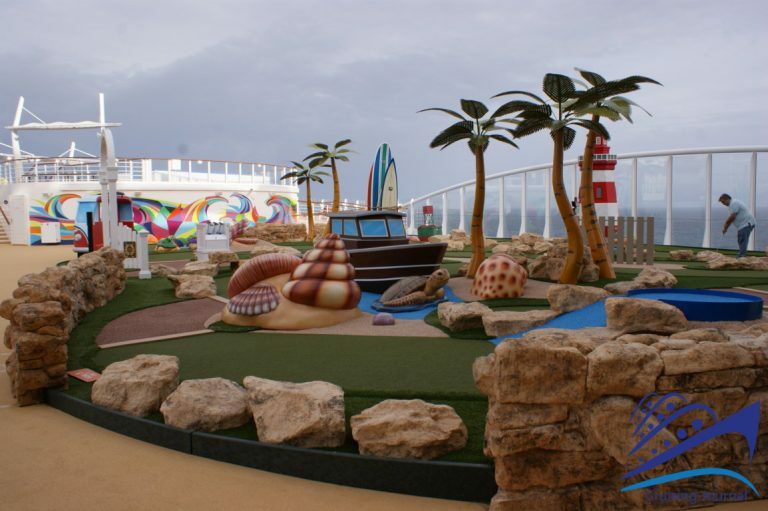 In the middle of the ship there is the sun area with two pools, the Main Pool and the Beach Pool, with the Pool Bar and the Sand Bar, and a series of water games such as The Perfect Storm Waterslides and the Splashaway Bay. 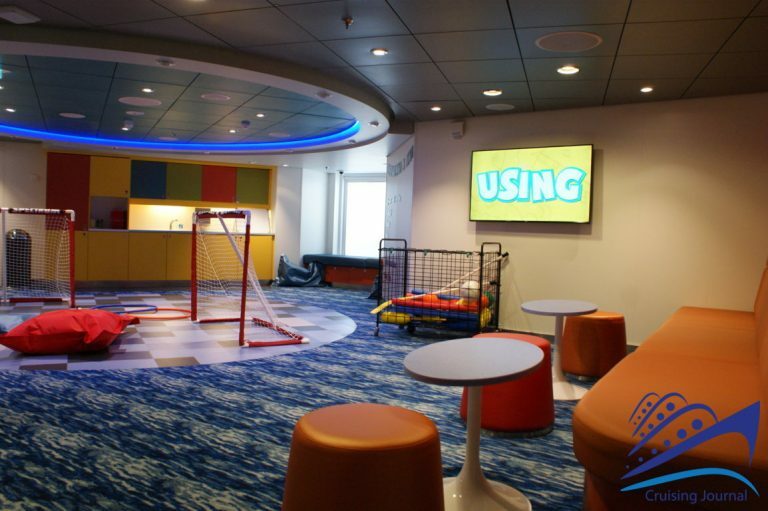 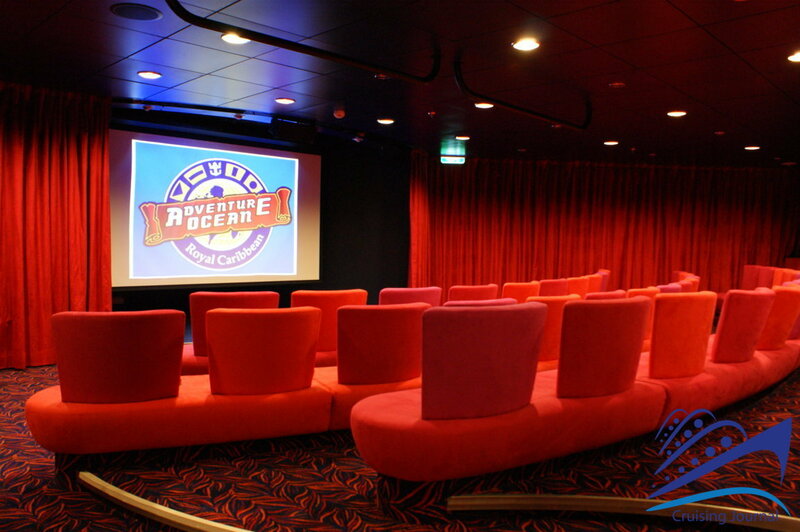 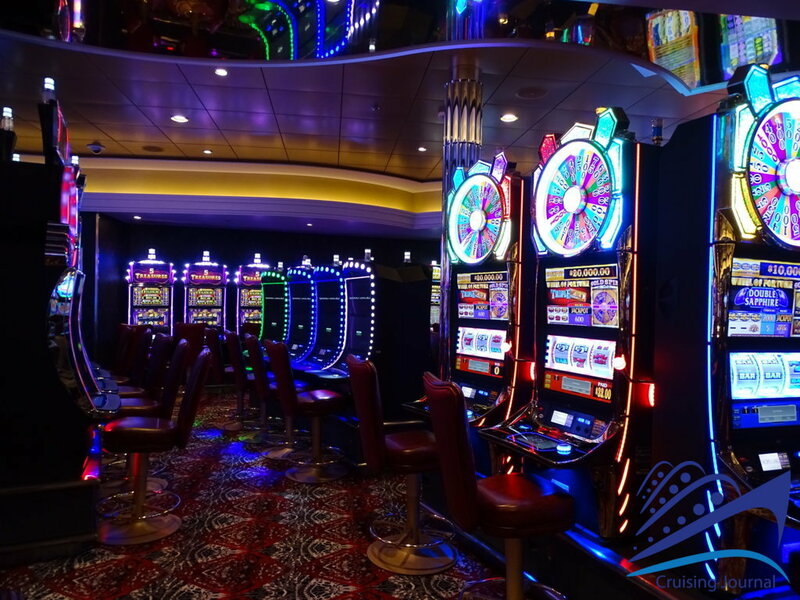 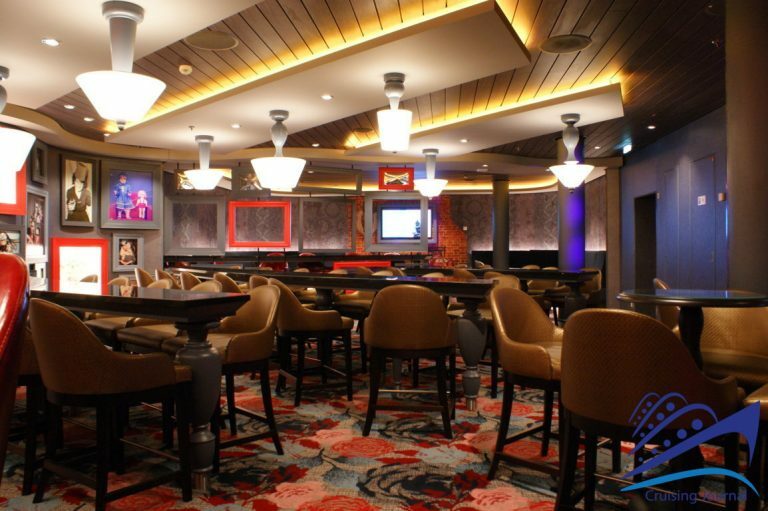 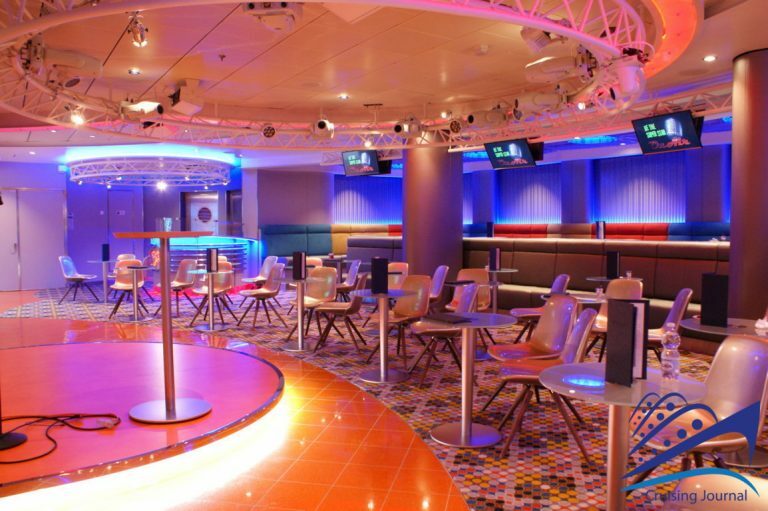 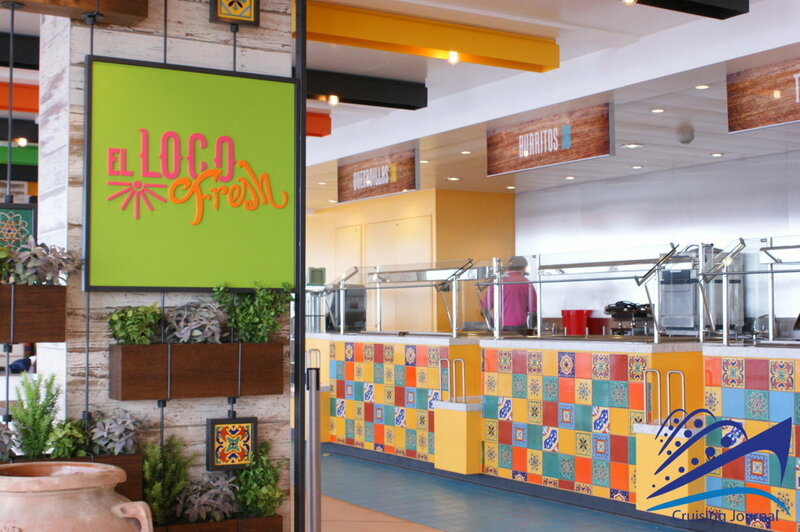 In the central part of the ship, once again at deck 15, we find Fuel Disco, reserved for teenagers, The Living Room, a media and meeting center, a table tennis area and El Loco Fresh, with specialties and snacks. 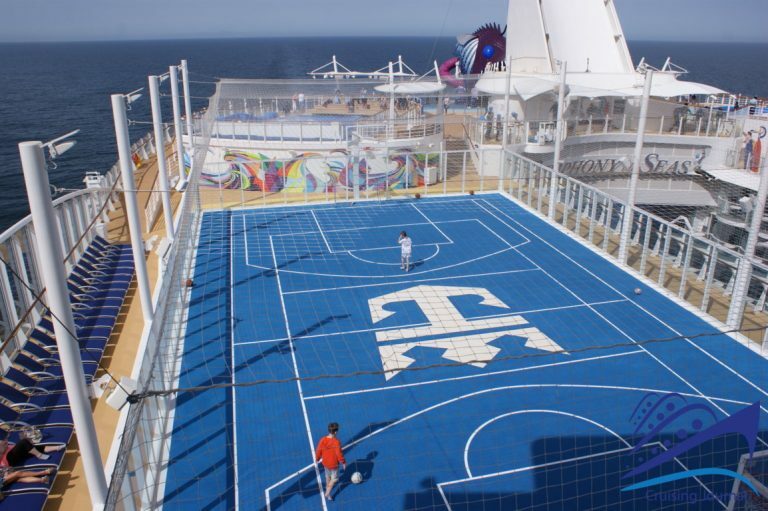 Finally, at the stern, the sports facilities, with the FlowRiders, the Mini Golf, and the Sports Court. 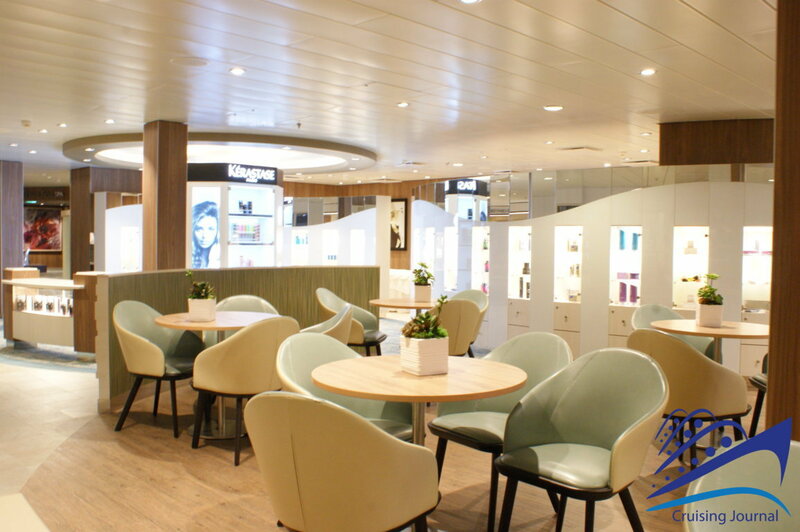 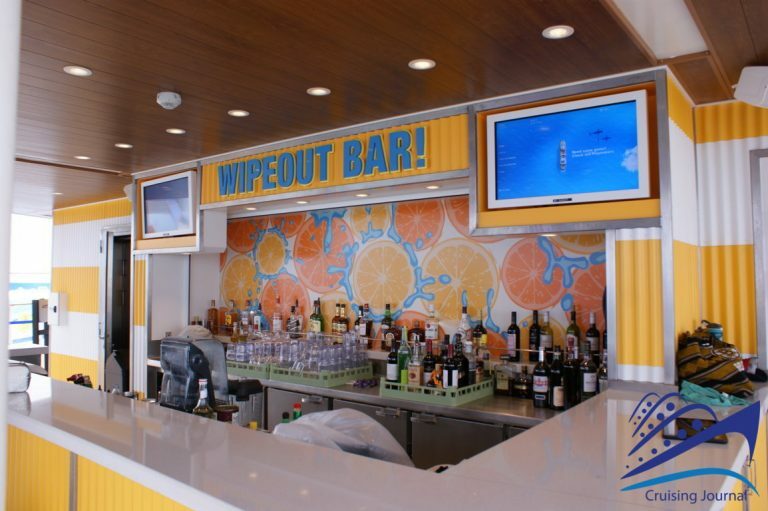 For those who just want to relax, Wipeout Bar, on the upper deck overlooking the area, is the ideal place to enjoy a drink while watching the stern wake. 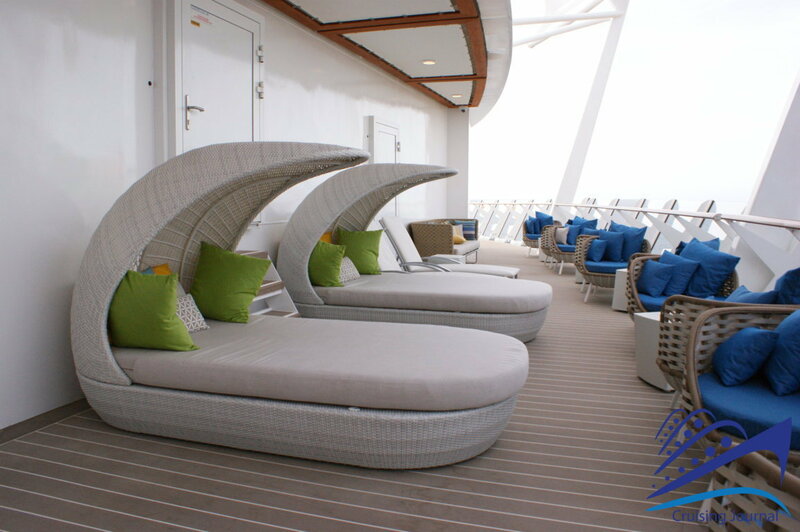 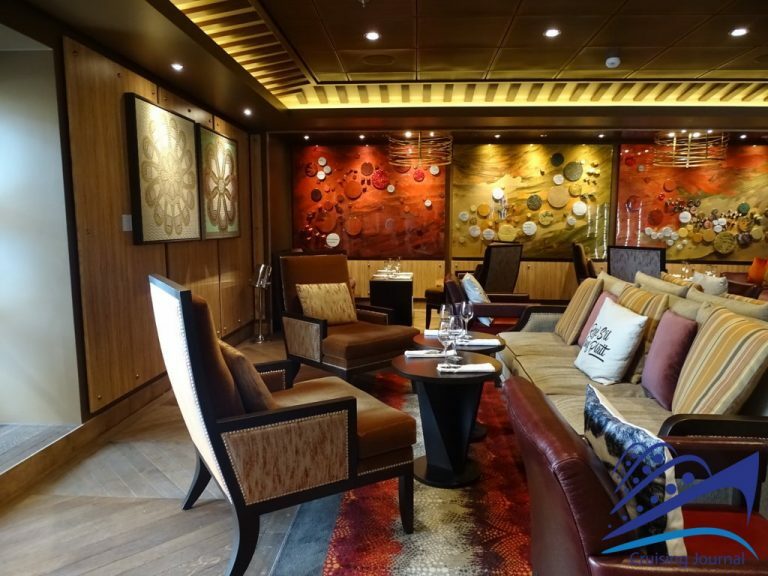 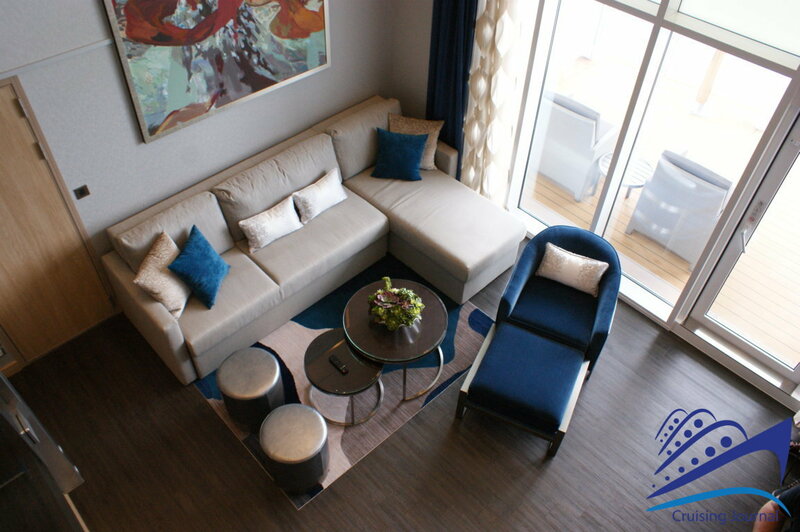 At deck 17, in the bow area, a large space with bars, sun loungers and alcoves is reserved for Suite guests. 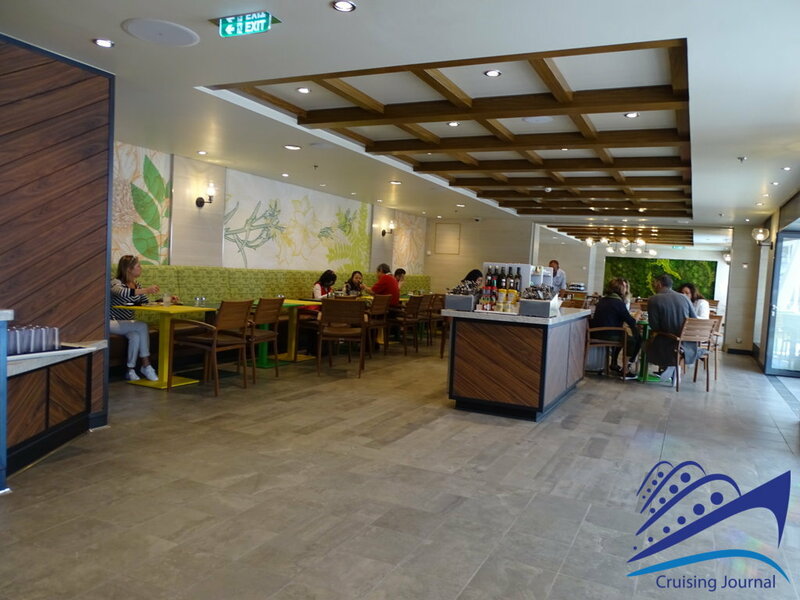 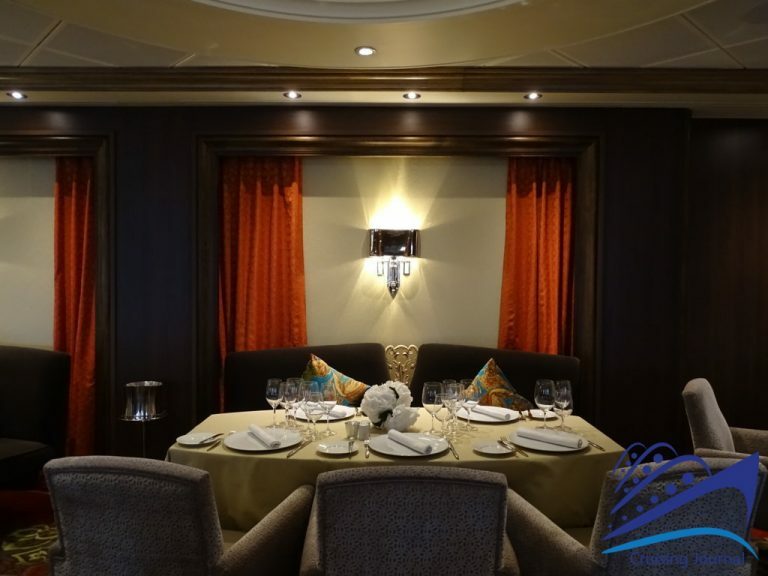 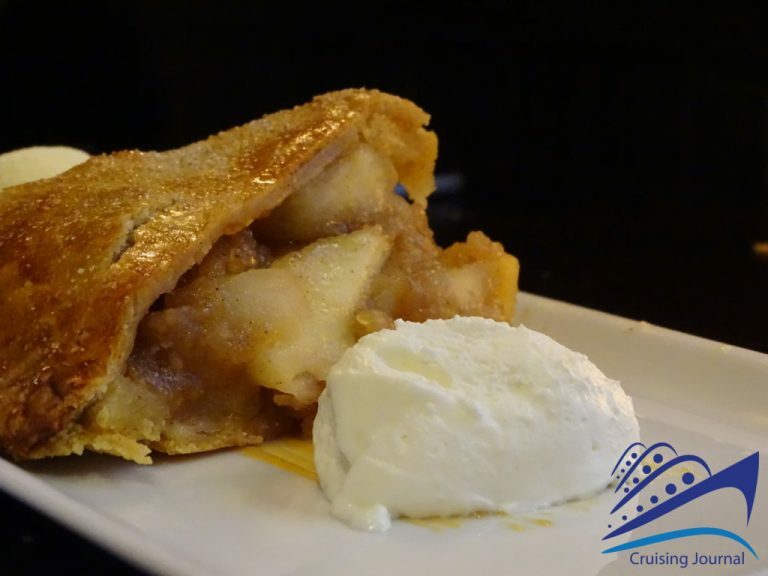 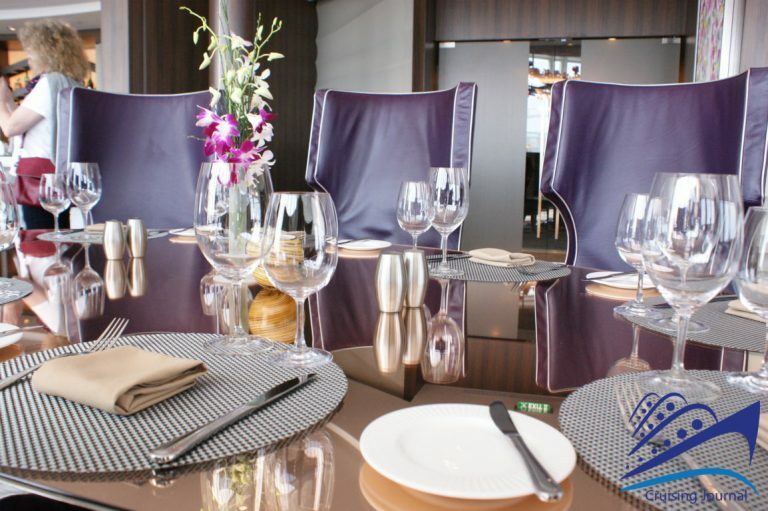 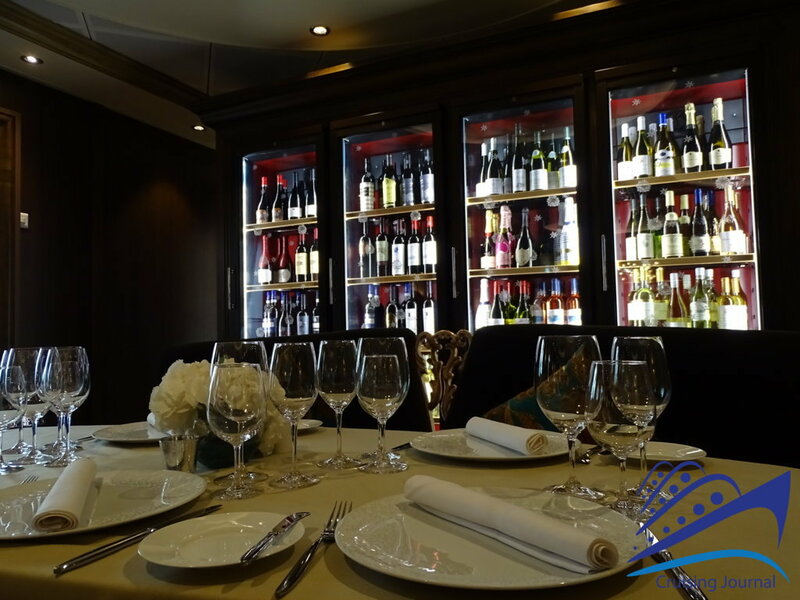 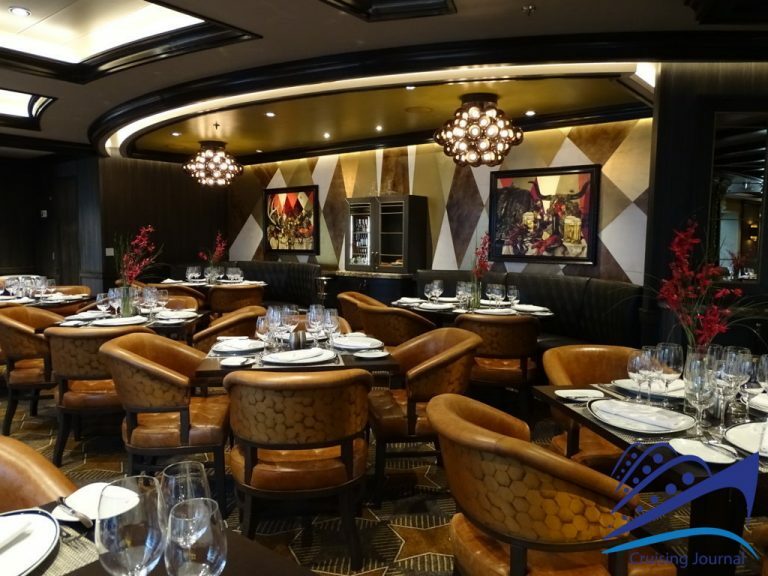 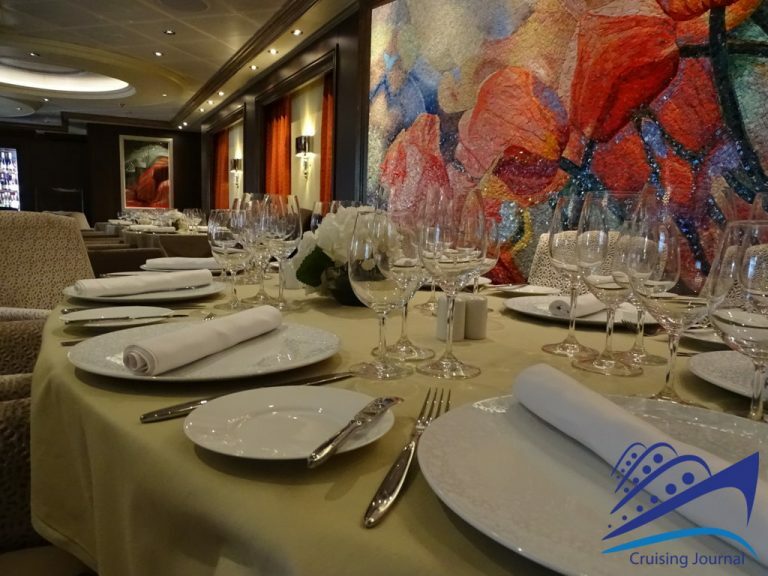 We have not yet talked about the many restaurants and restaurant areas you will find on board, and since there is a wide offer, we will just give you a quick review, because describing them in detail would be really challenging. 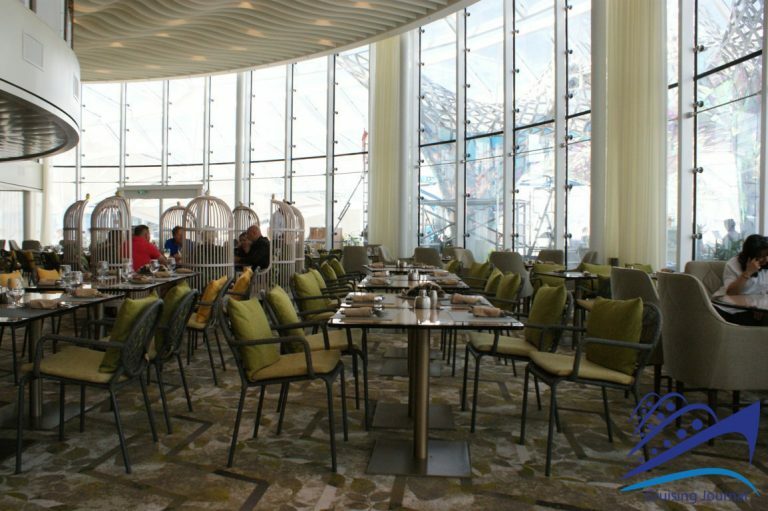 Main Dining Room, the main restaurant, whose three decks include My Time Dining and two classic service halls, is a really amazing place. 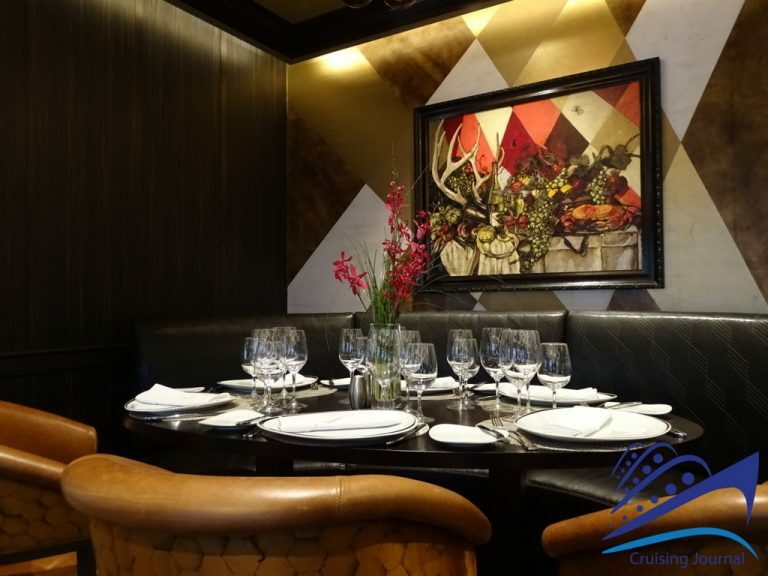 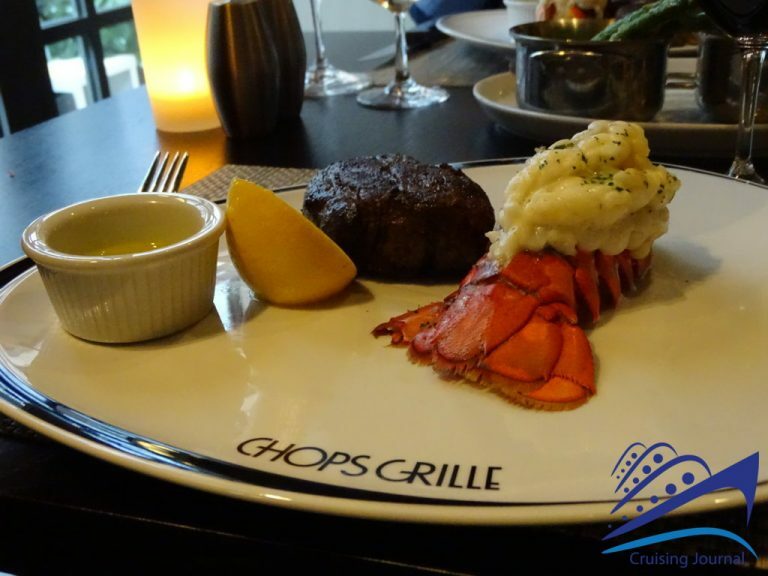 However, some of the most exclusive restaurants are located in Central Park: Chop’s Grill, for meat and Surf and Turf lovers, and 150 Central Park, maybe the most luxurious restaurant on board. 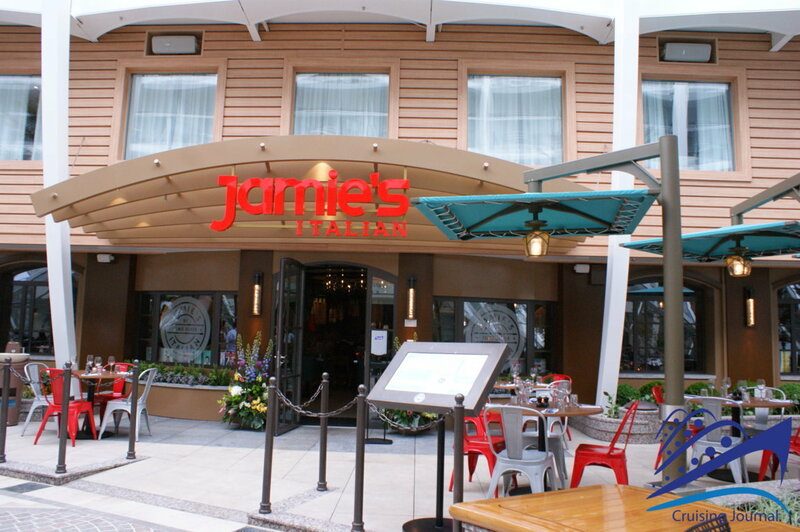 A little further on, also hidden by plants and benches, we find Jamies’ Italian, where you can taste great cold cuts and Italian specialties, and Park Cafè, which serves salads, sandwiches and snacks. In the same area, if you prefer an aperitif surrounded by nature, you can stop at Trellis Bar, while for a glass of excellent wine Vintages is a wine shop with fine wine labels. 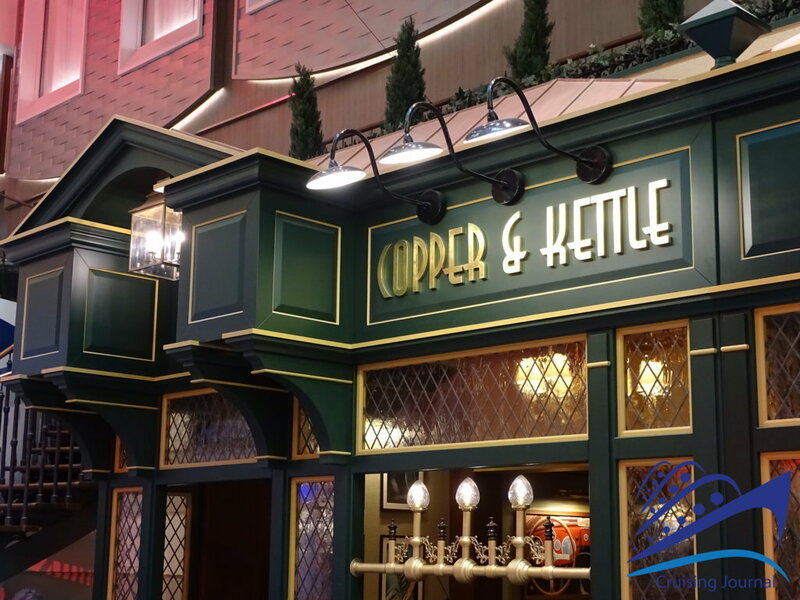 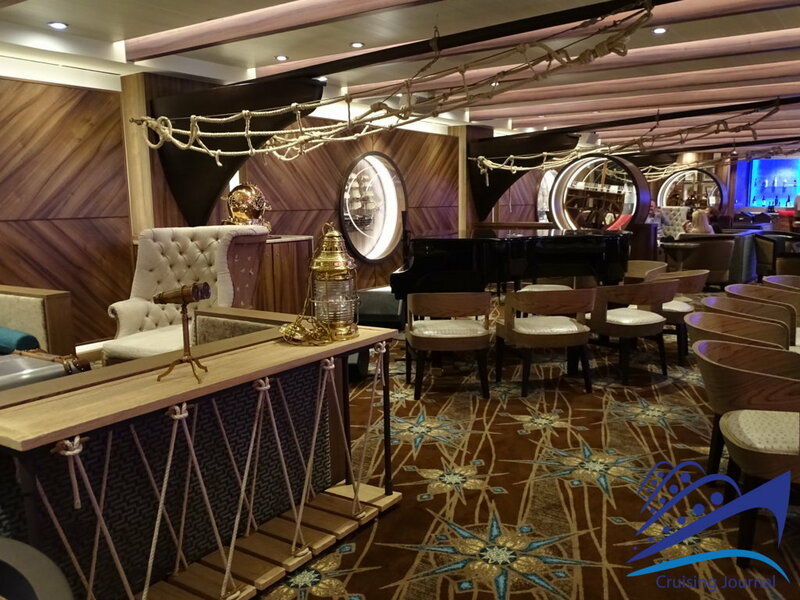 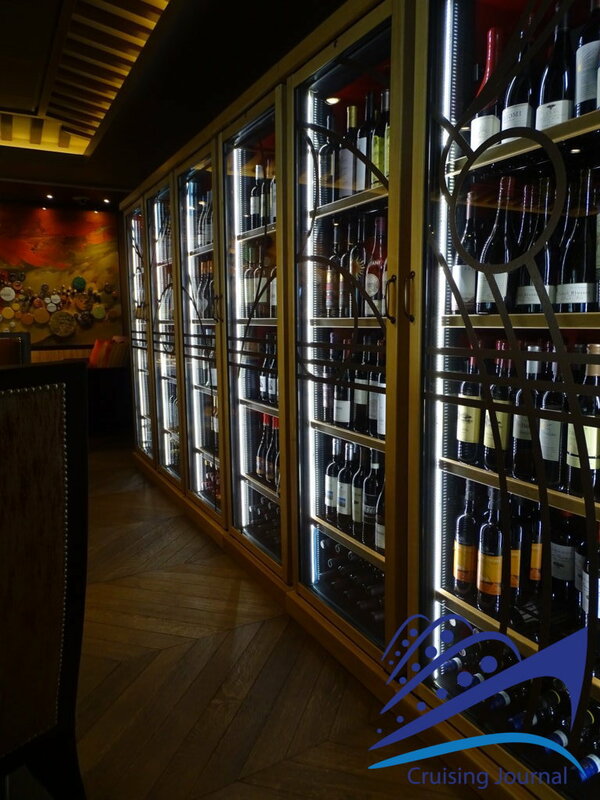 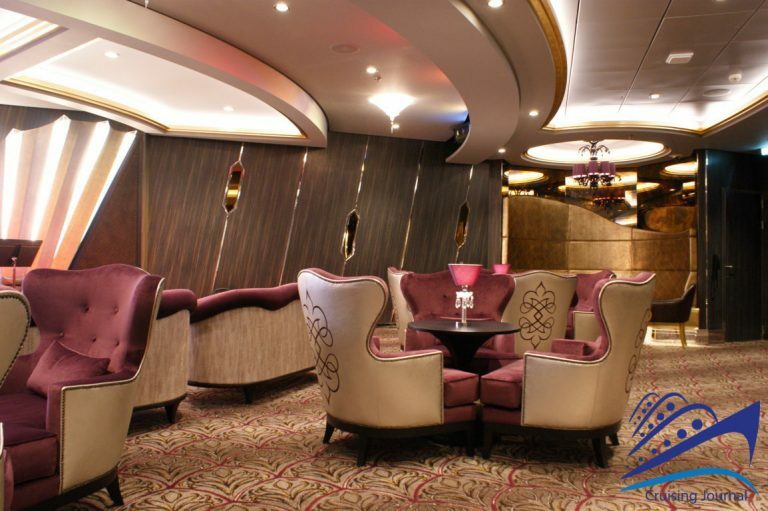 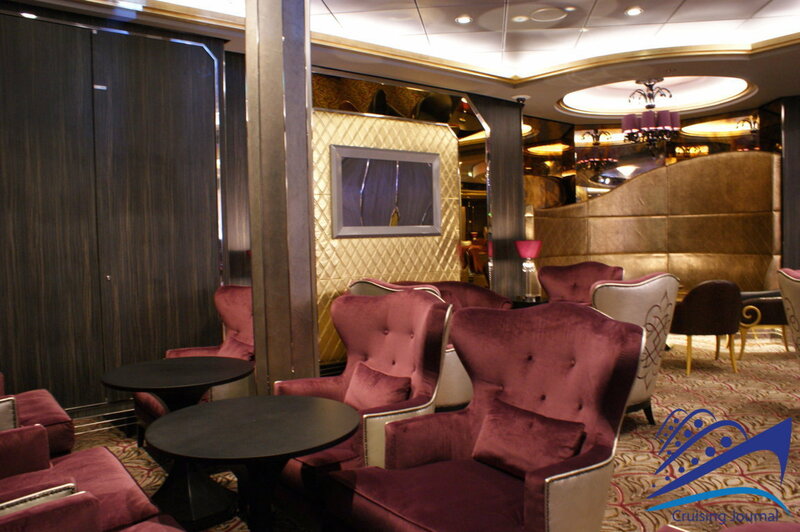 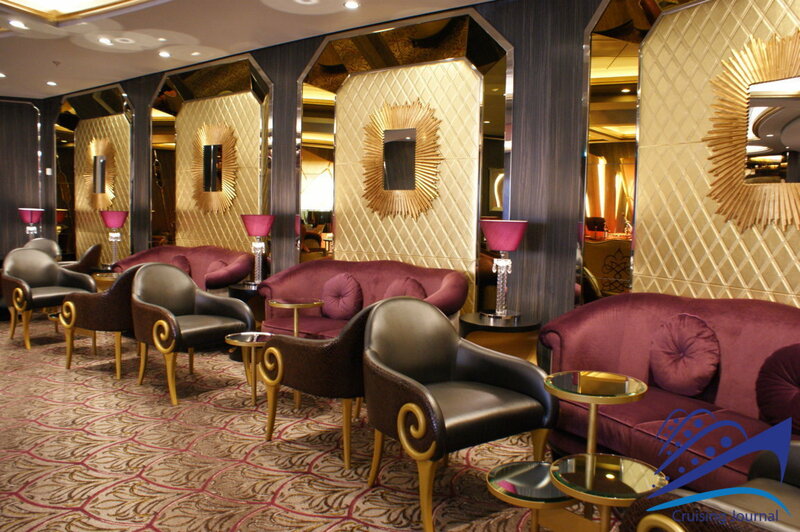 But this is only half of the restaurants and bars you will find on board… At deck 12, Wonderland will offer you one of the most extravagant experiences in your life. 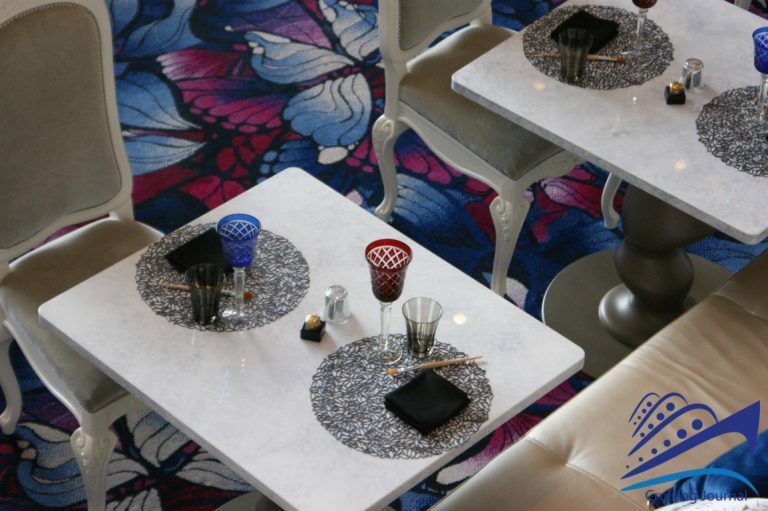 Surrounded by tall colored glasses and sitting on bizarre chairs, you will choose your dishes from an excellent menu and enjoy lovely views of Central Park. 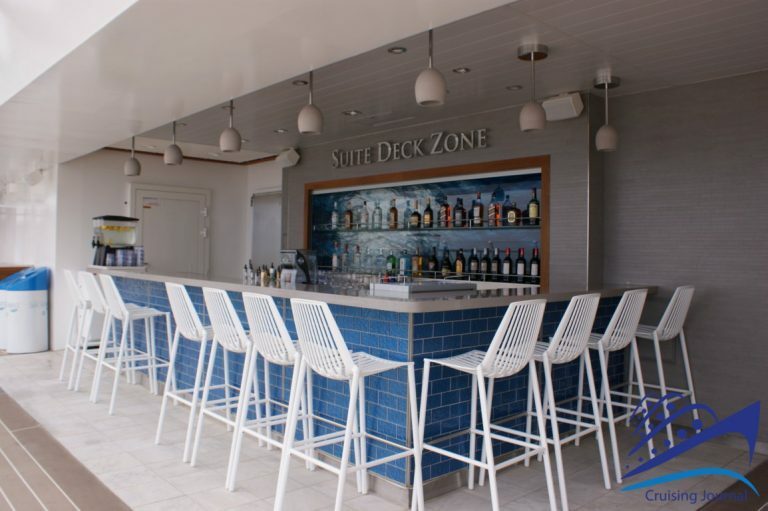 As for deck 15, we have already mentioned Solarium Bistro, a charming and cozy place located at the bow, with both indoor and outdoor tables, as well as El Loco Fresh, which is ideal for afternoon snacks. 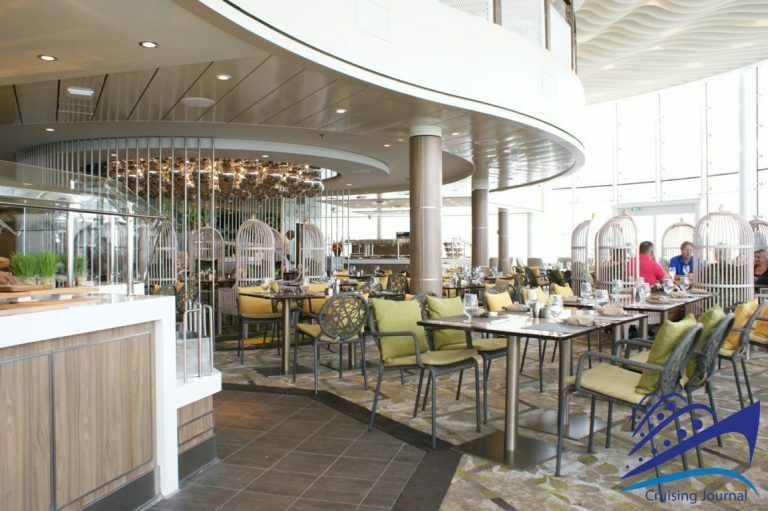 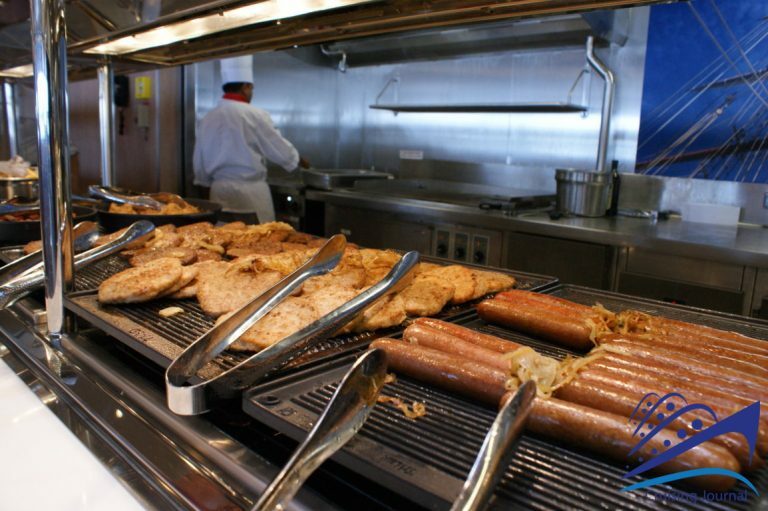 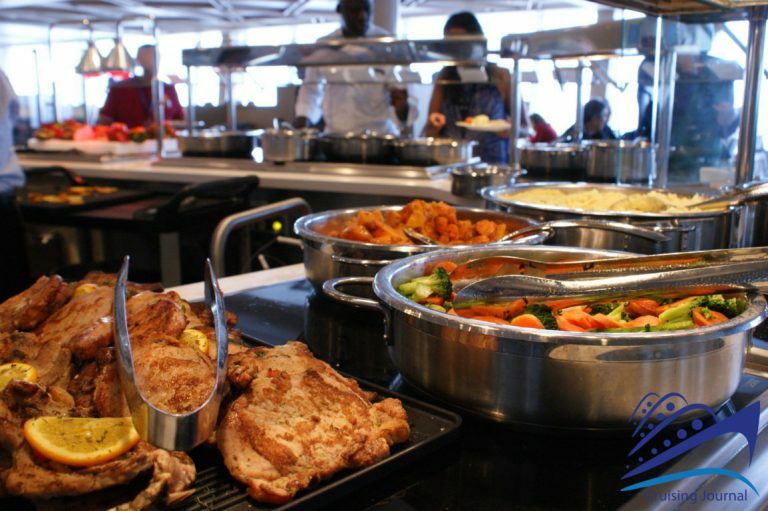 Deck 16 houses the large Windjammer Cafè, which serves a hearty buffet with always different local specialties. 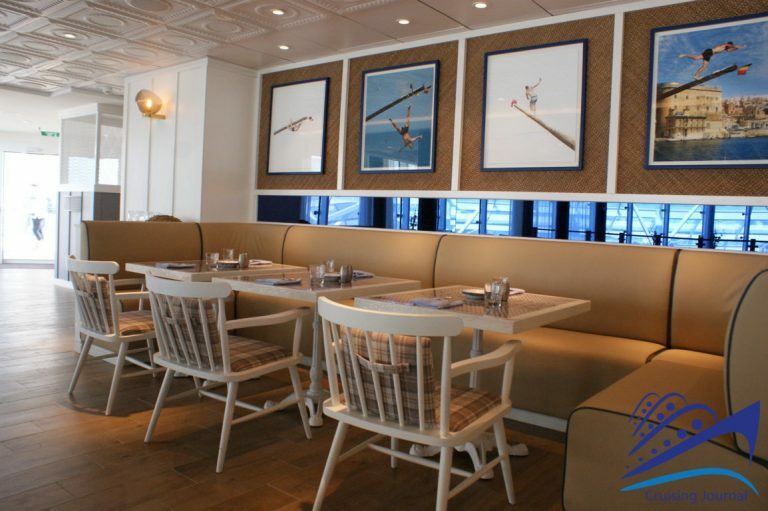 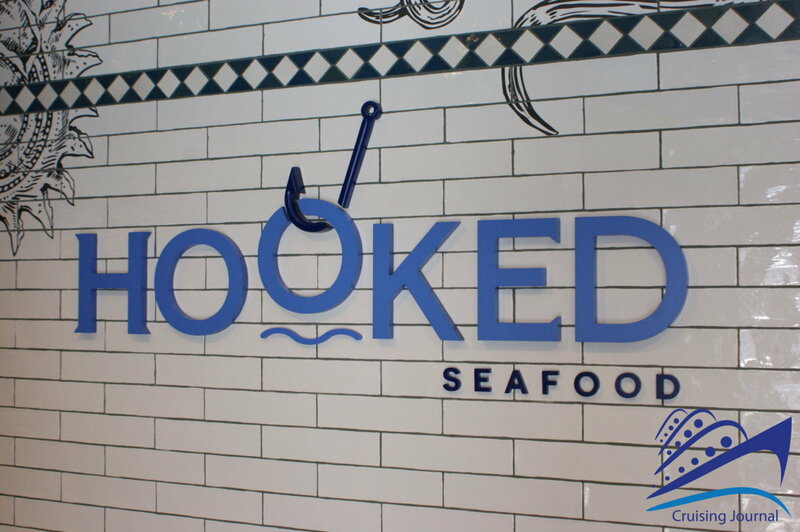 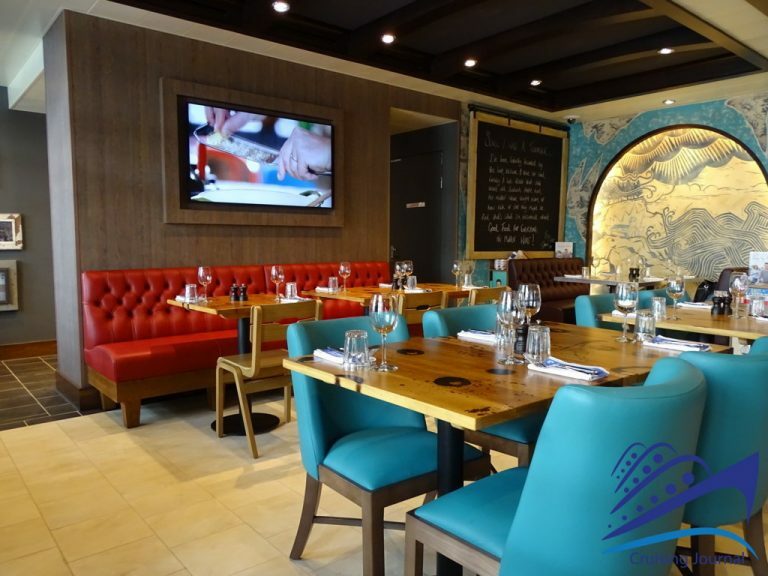 At the bow, there is the new Hooked Seafood serving great seafood and raw fish dishes and characterized by bright spaces and a lively marine style. 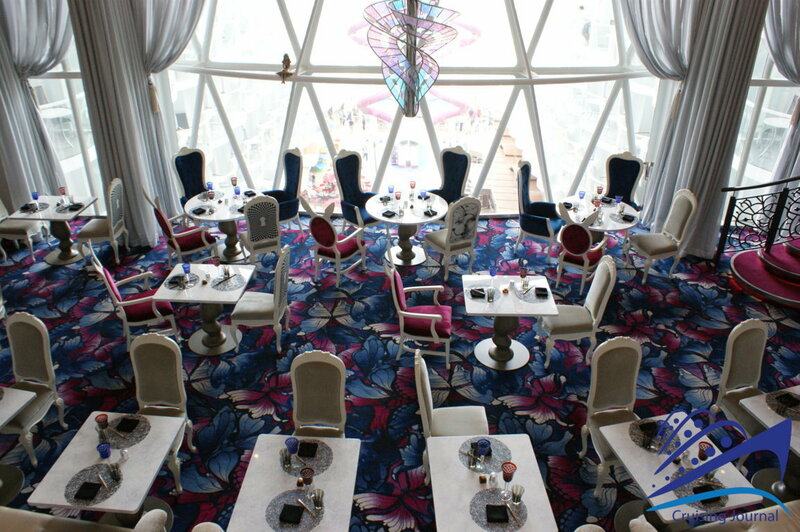 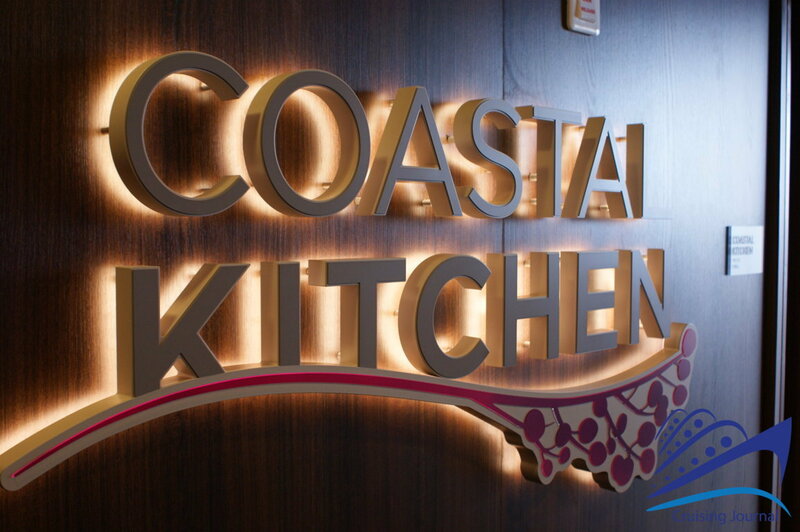 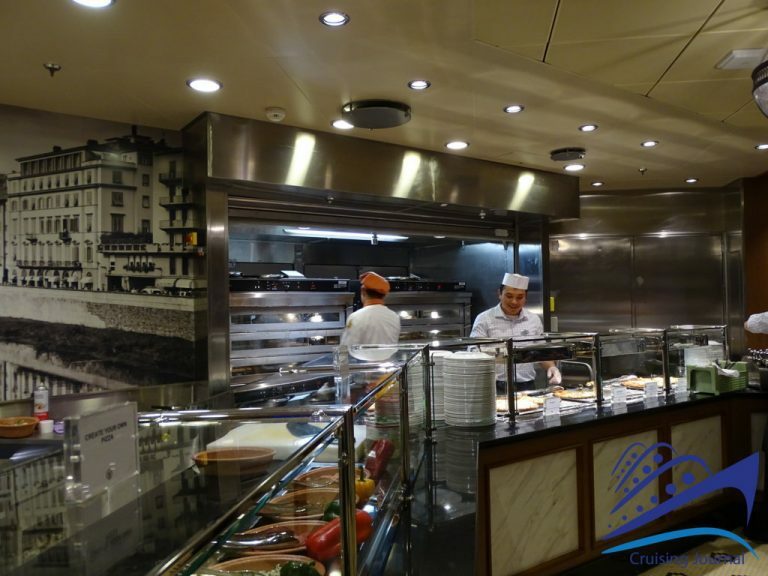 Finally, at deck 17, with view of the ship from above, Coastal Kitchen is another good solution. Open for breakfast to dinner time, it is located just next Suite Lounge. 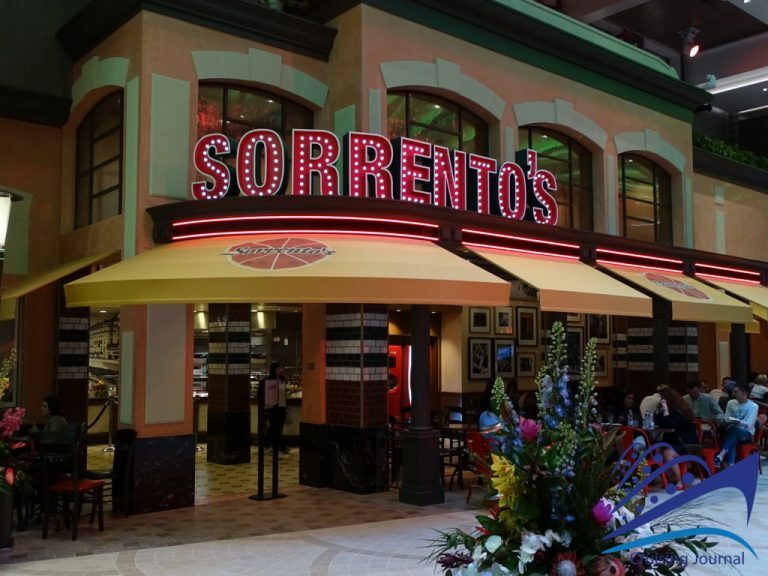 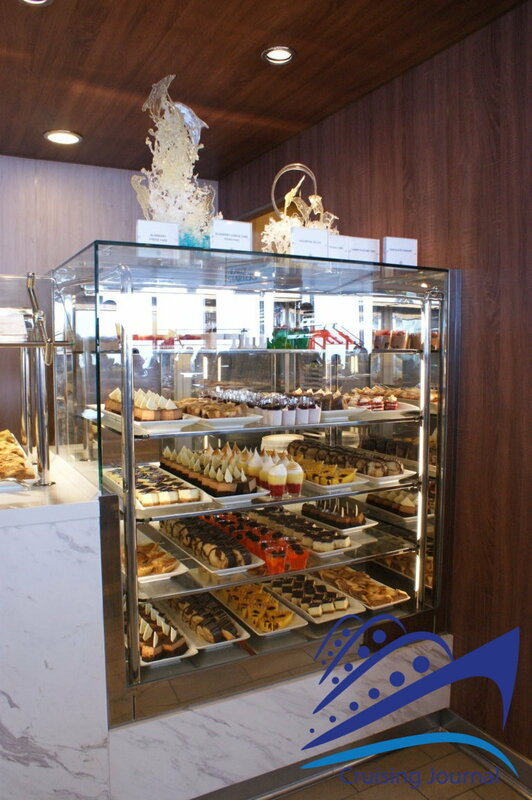 At Cafè Promenade and Sorrentos you will find snacks and pizza almost at all hours of the day and night. 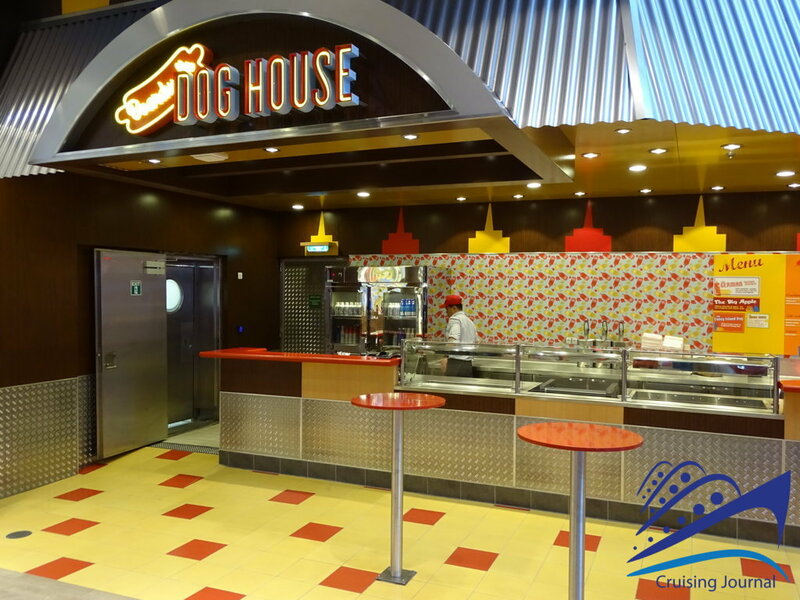 The BoardWalk will also tempt you with Dog House, the famous Johnny Rockets and the specialties served by Playmakers Sportsbar. 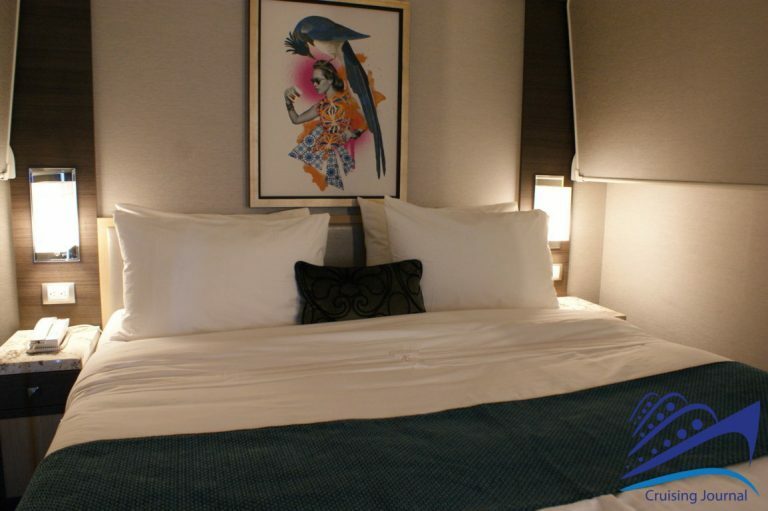 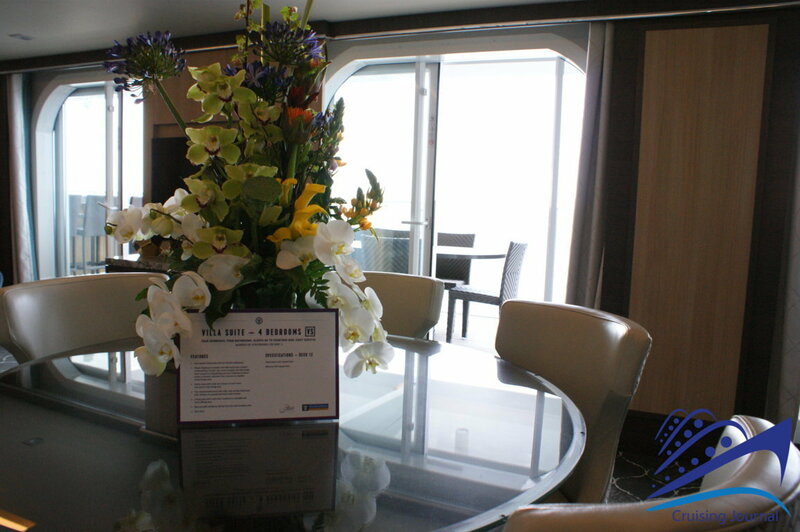 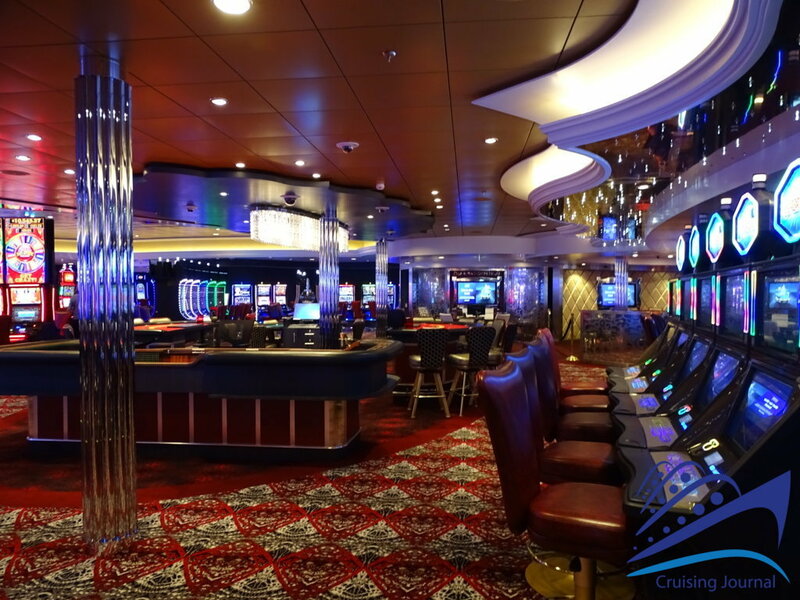 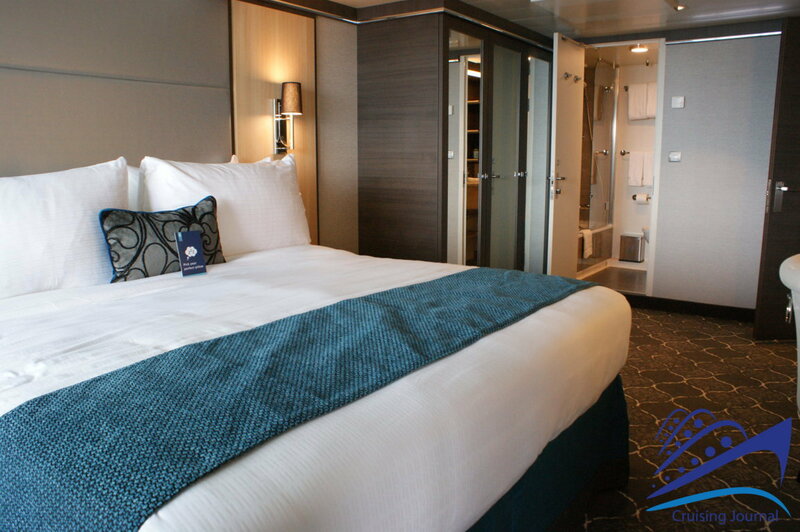 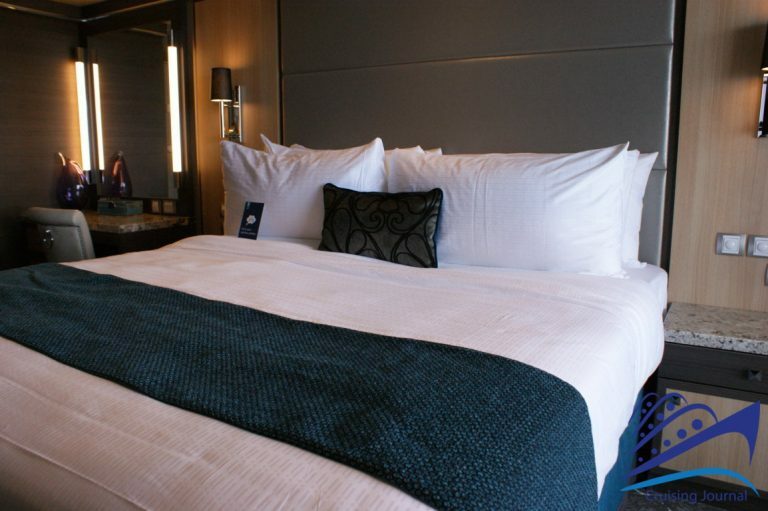 An Oasis class ship offers a wide range of cabins: indoor, balcony, Promenade and Central Park view cabins, and then Suites, Lofts and real apartments. 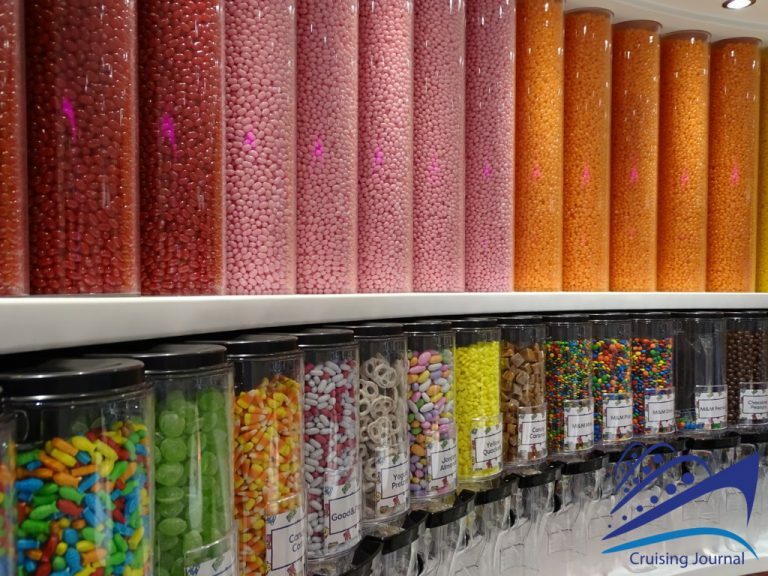 So, you can make your choice based on your needs and desires. 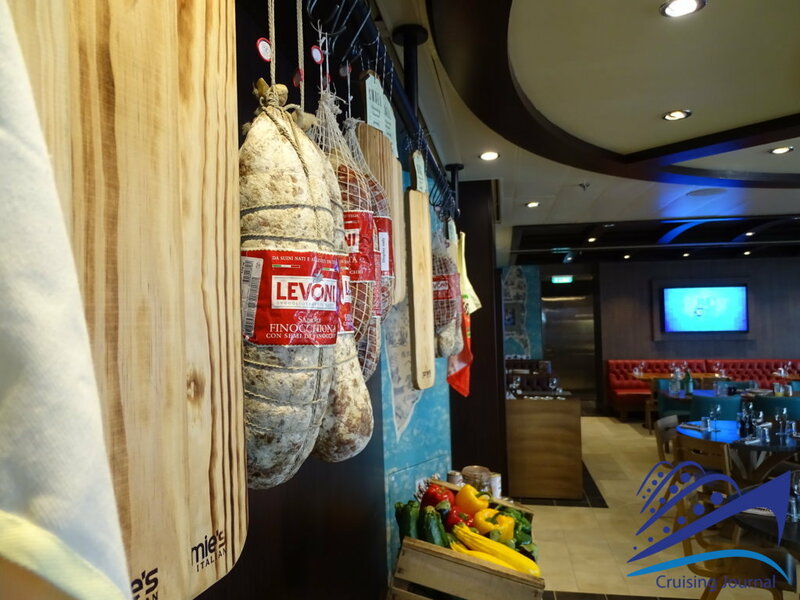 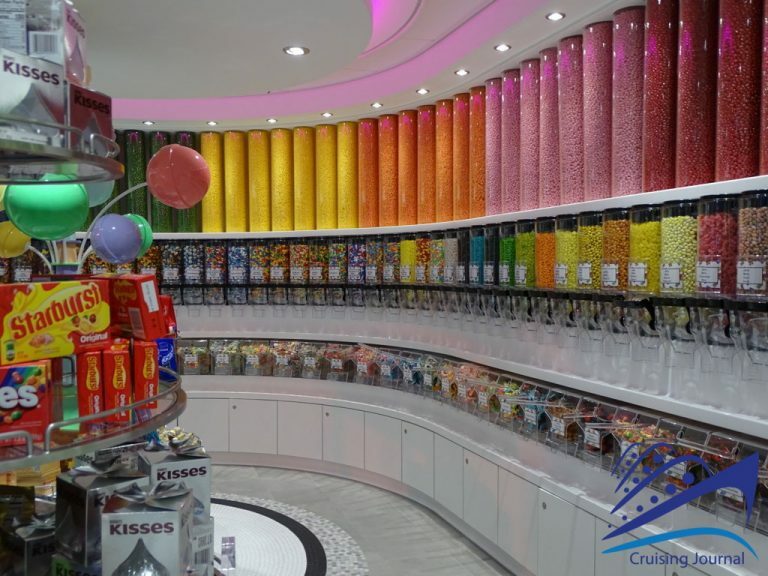 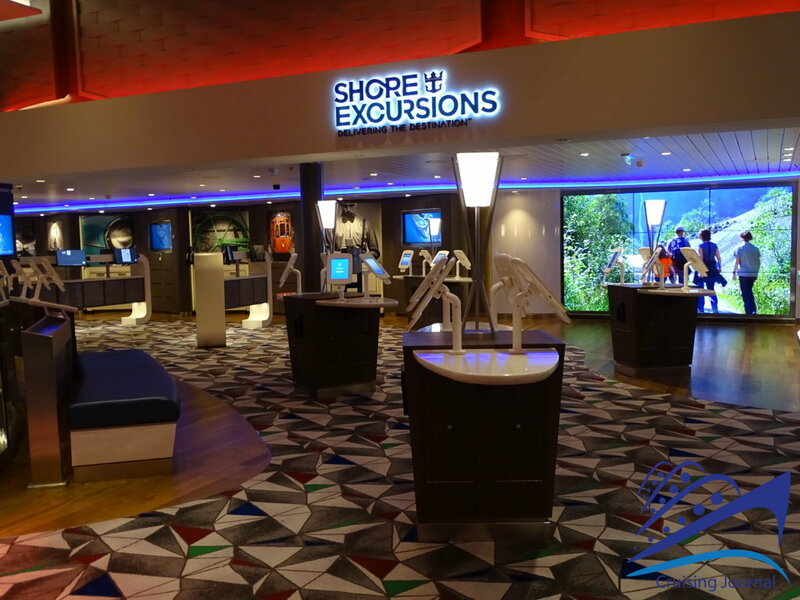 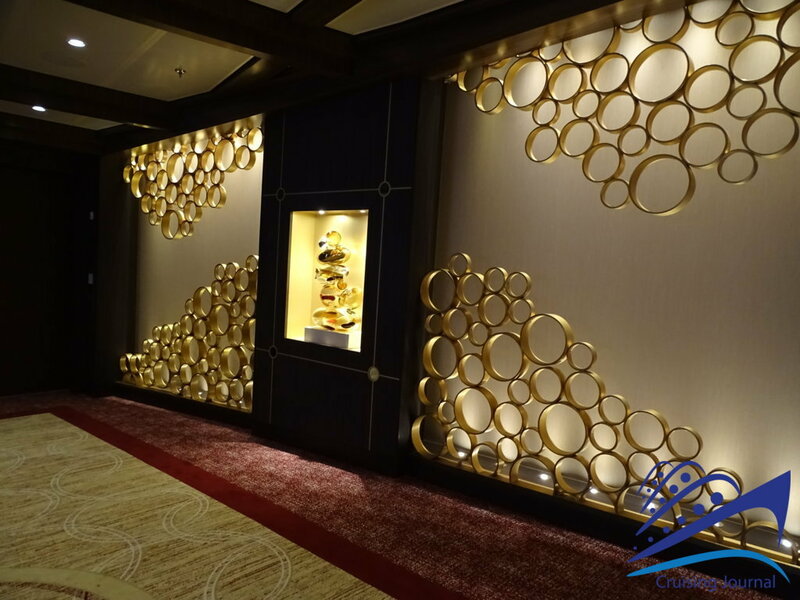 Symphony of the Seas is the latest generation of cruise ships, able to offer innovative but also traditional solutions, like those of a classic cruise, as well as great food and lots of fun. 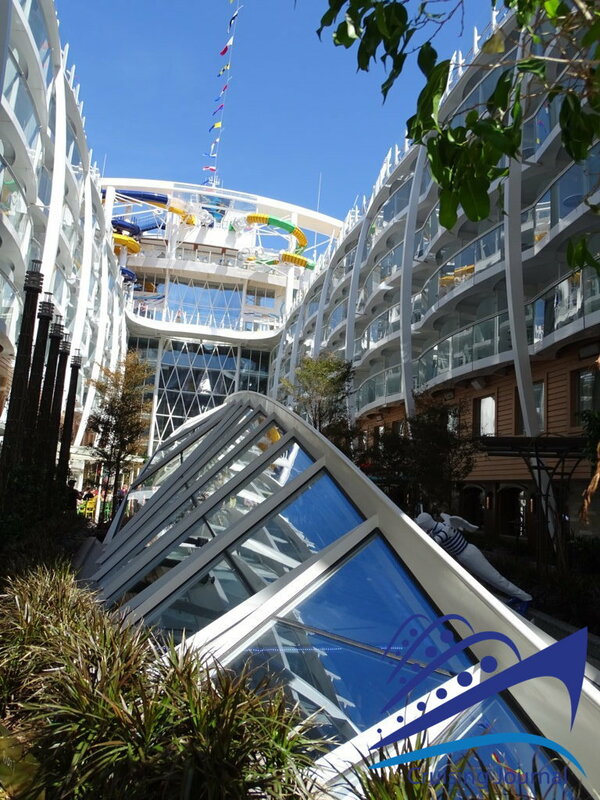 Despite the size of its spaces, it still offers you the chance to enjoy the sea and take advantage of the Royal Caribbean service, which is always impeccable. 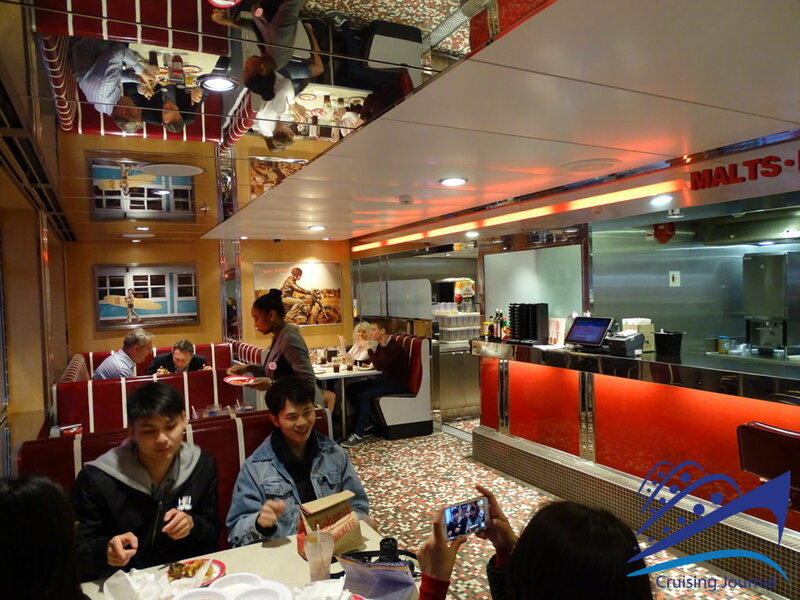 Usually the number of passengers on board, which is really impressive, does not create any inconvenience, since the distribution and the size of the premises was carefully designed. 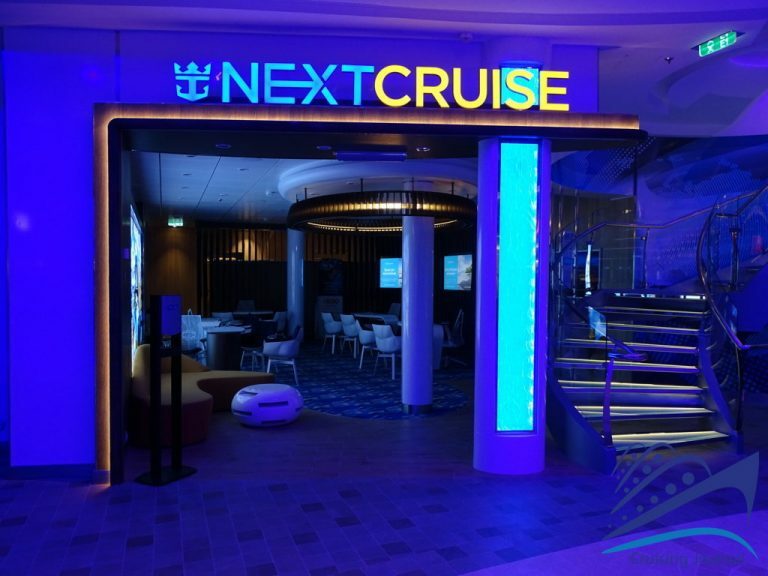 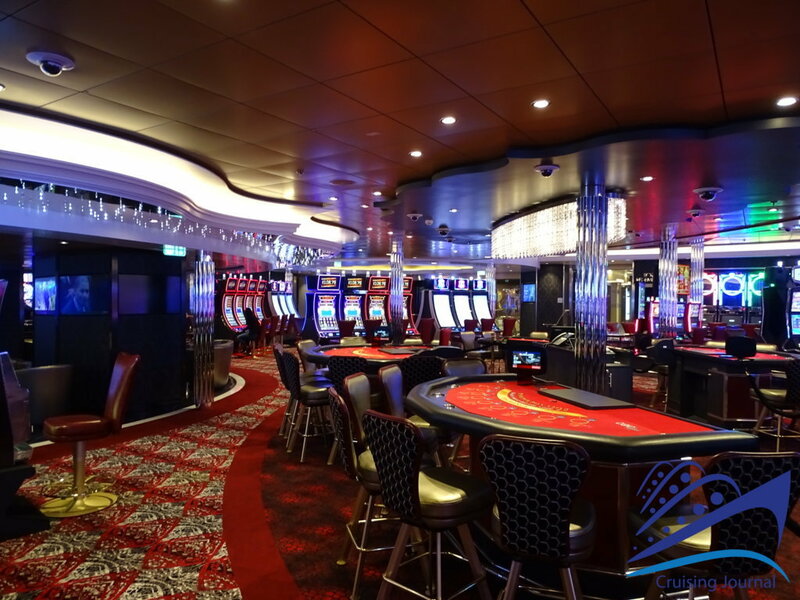 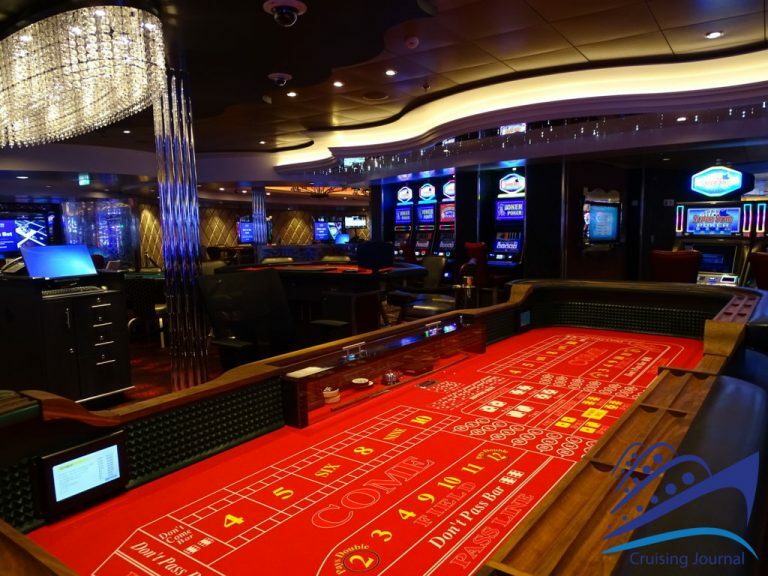 Maybe it is not within everyone’s means, but everyone, here, can find a place where to feel at ease and enjoy the cruise experience and its incredible technology.